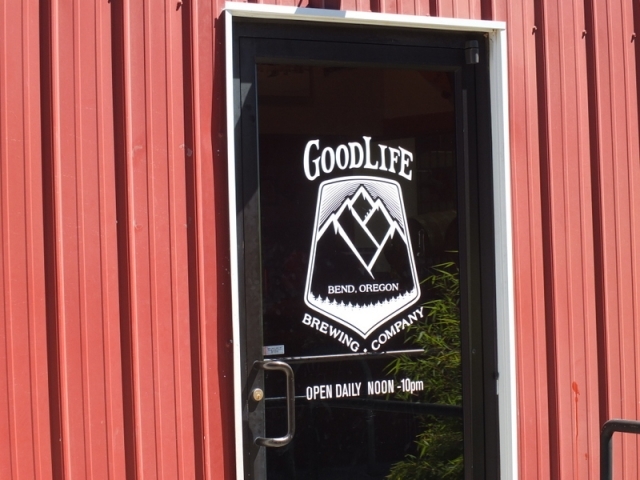 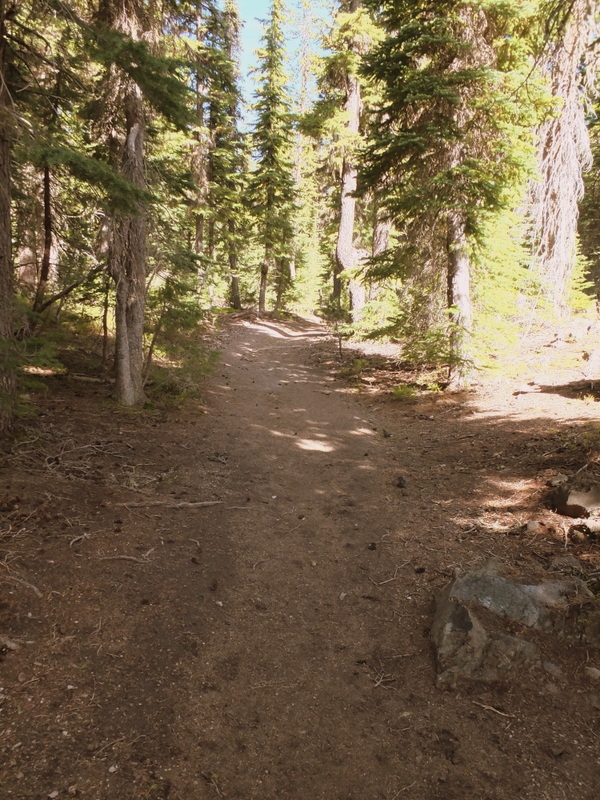 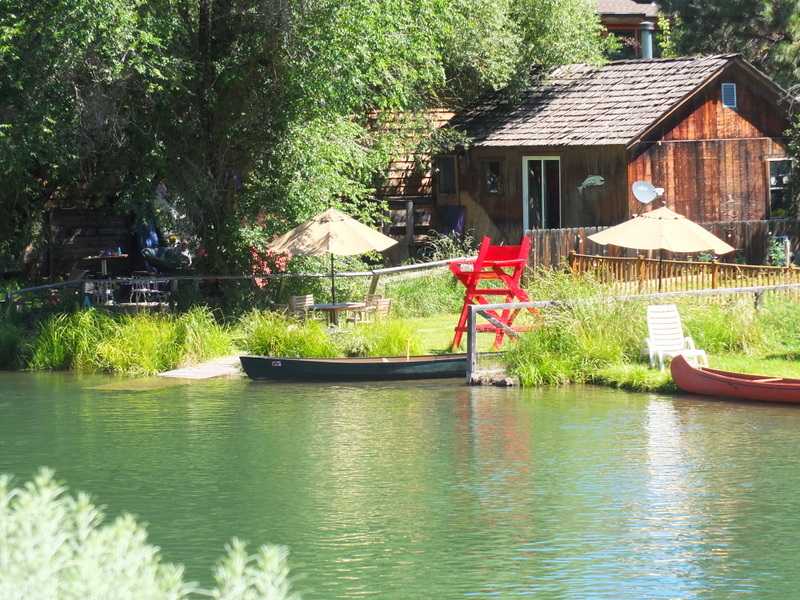 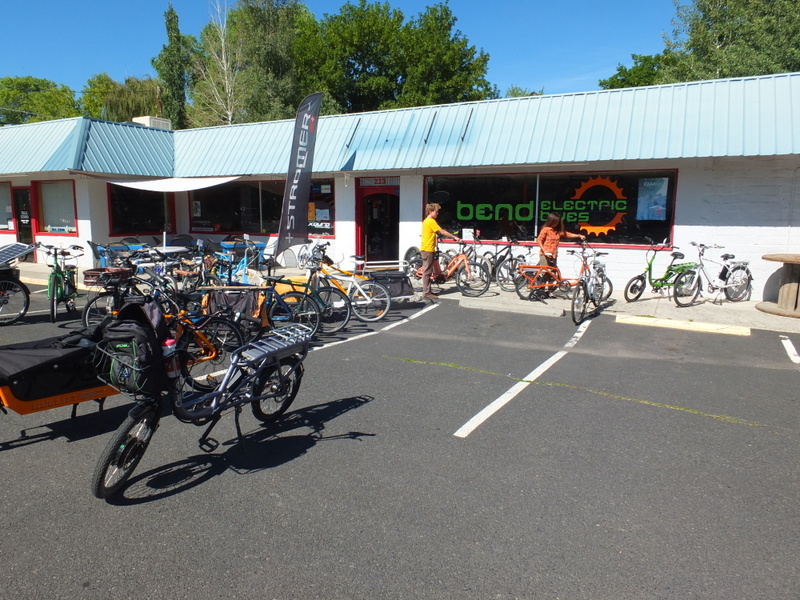 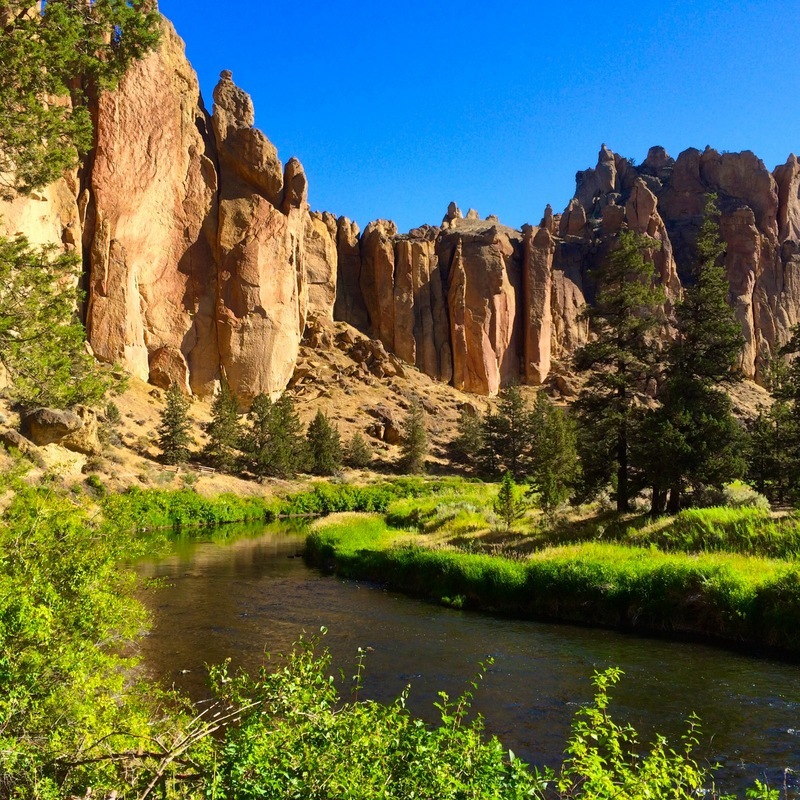 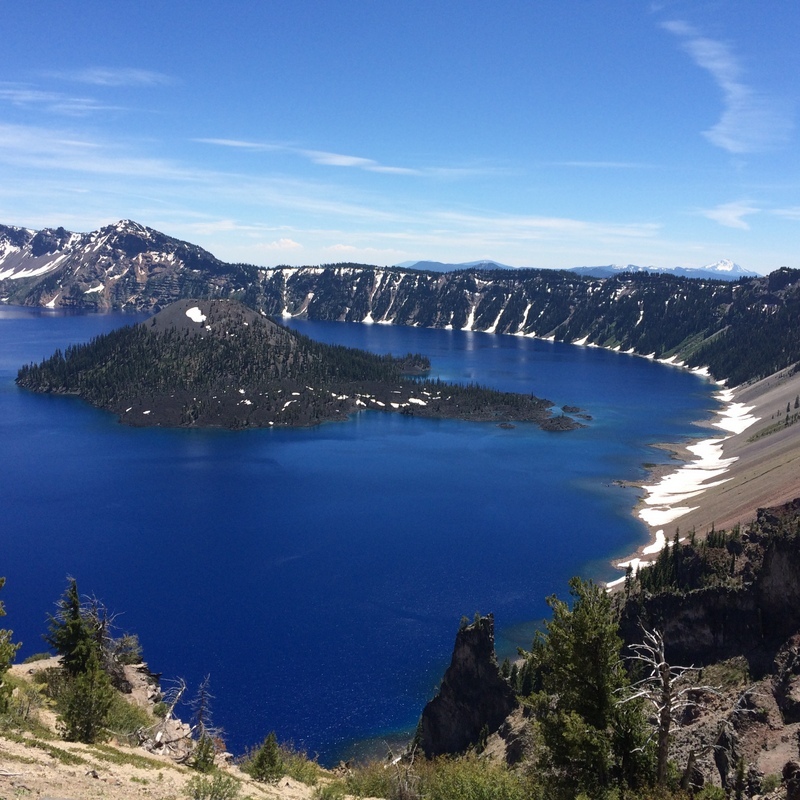 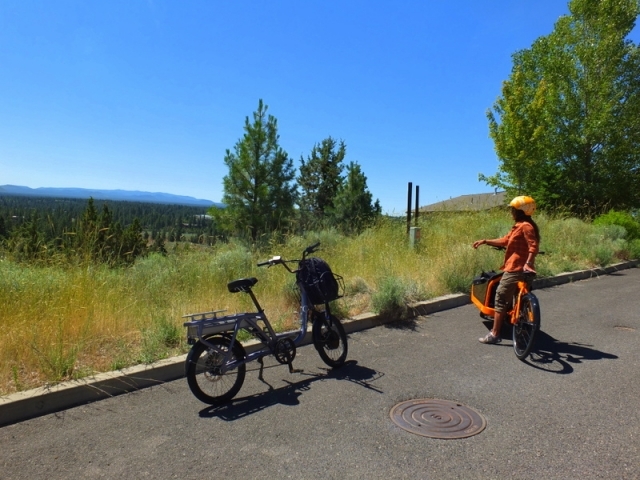 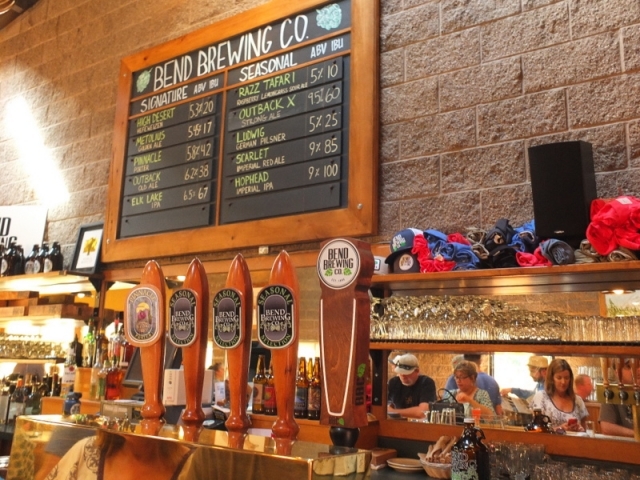 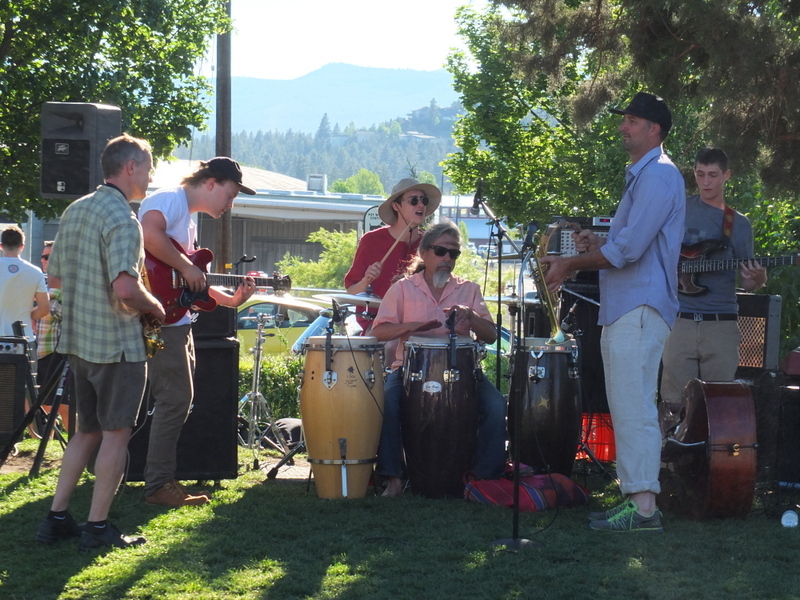 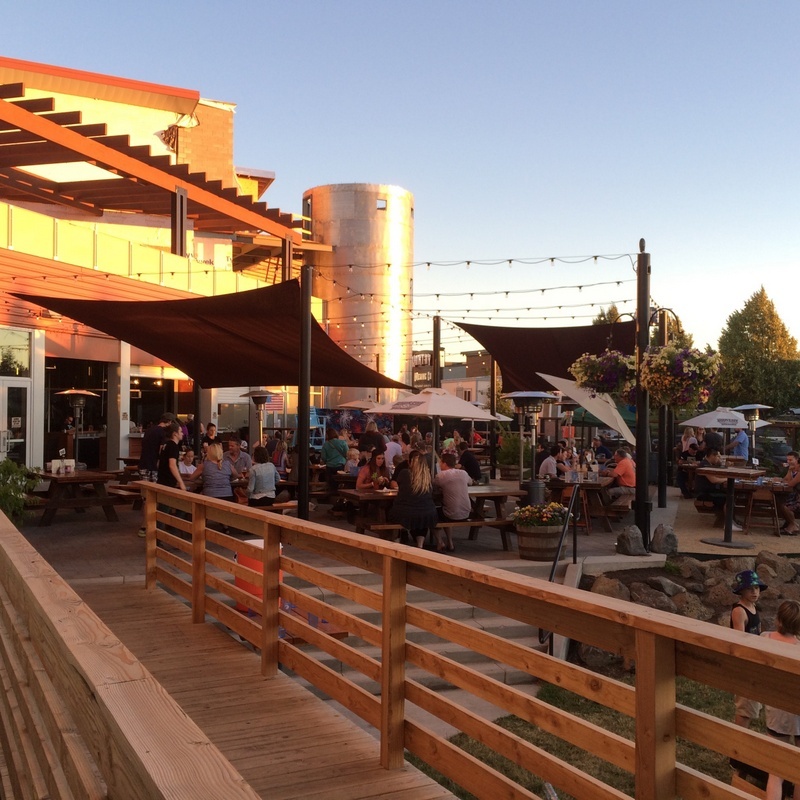 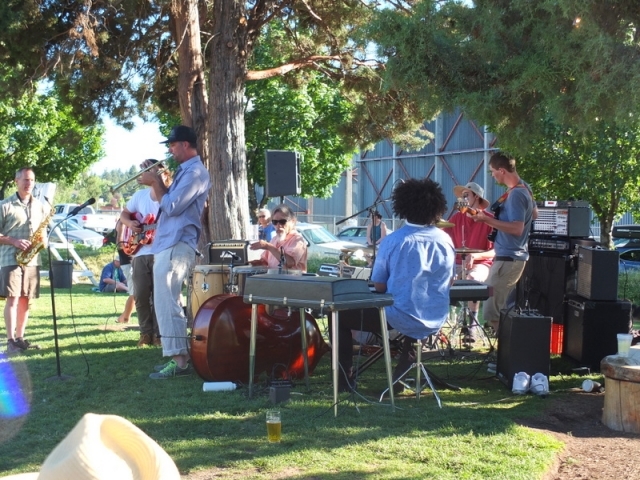 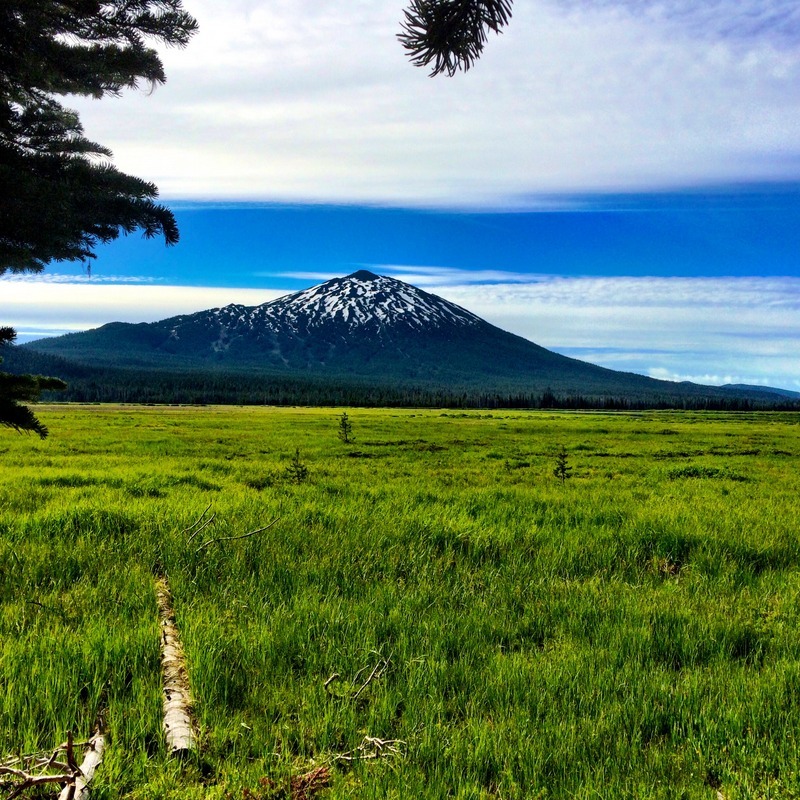 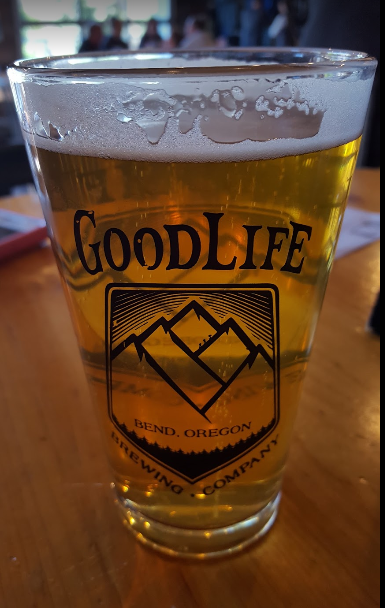 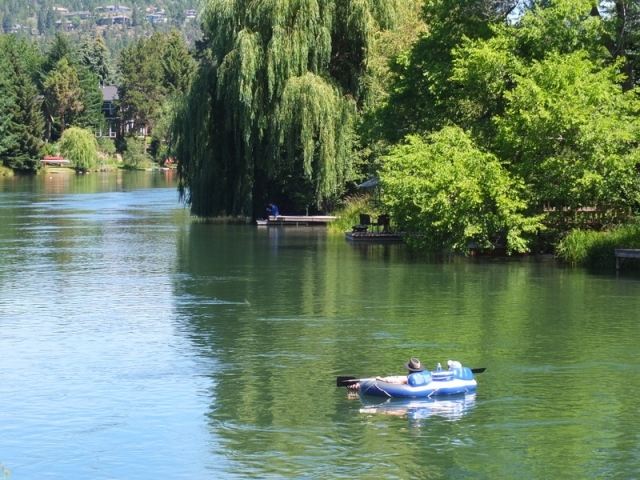 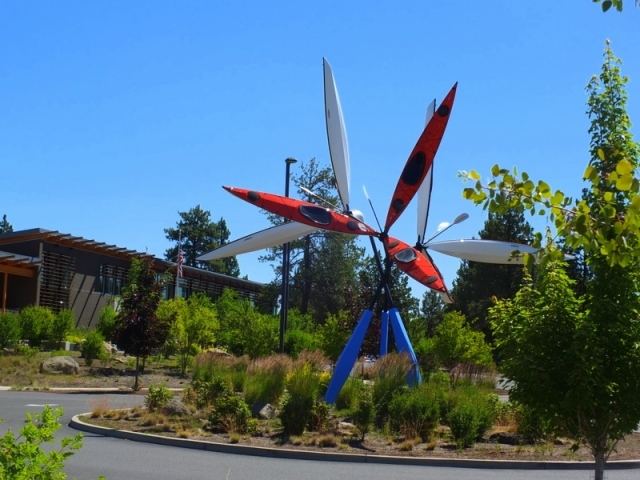 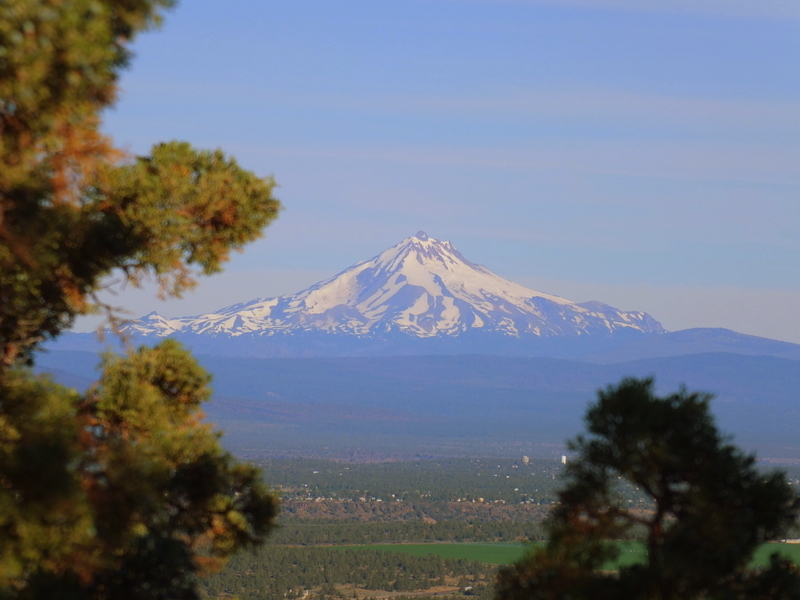 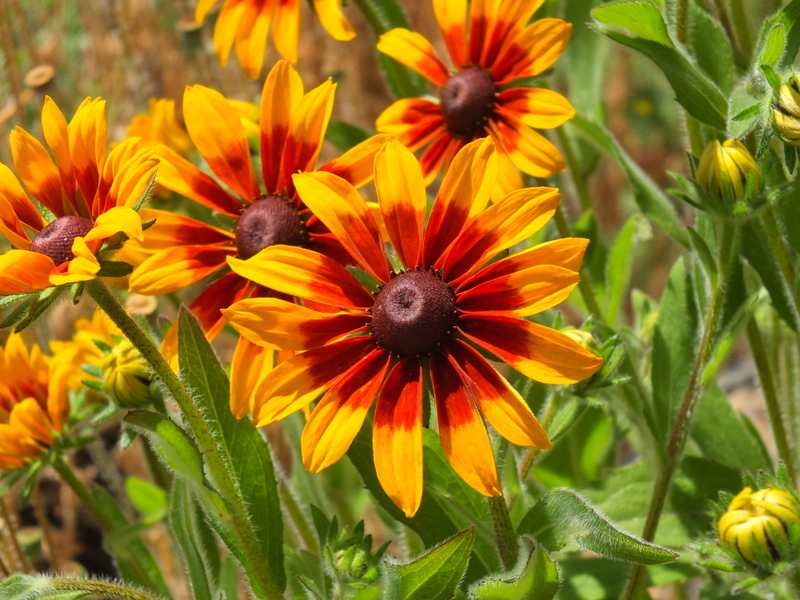 Bend, Oregon seems to be a trendy spot these days — several people I know have retired up that way and the “beer media” talks about it all the time, so why not a visit for some hikes and brews around (the) Bend? 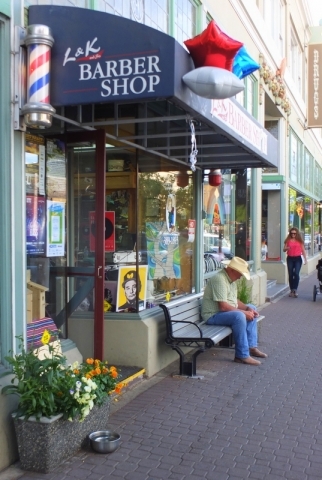 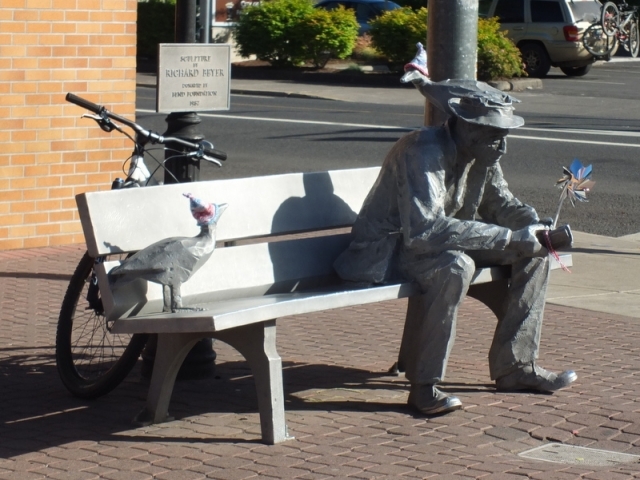 Bend is a city of about 90,000 people and a metro area of more than 160,000 so it really feels quite urban. 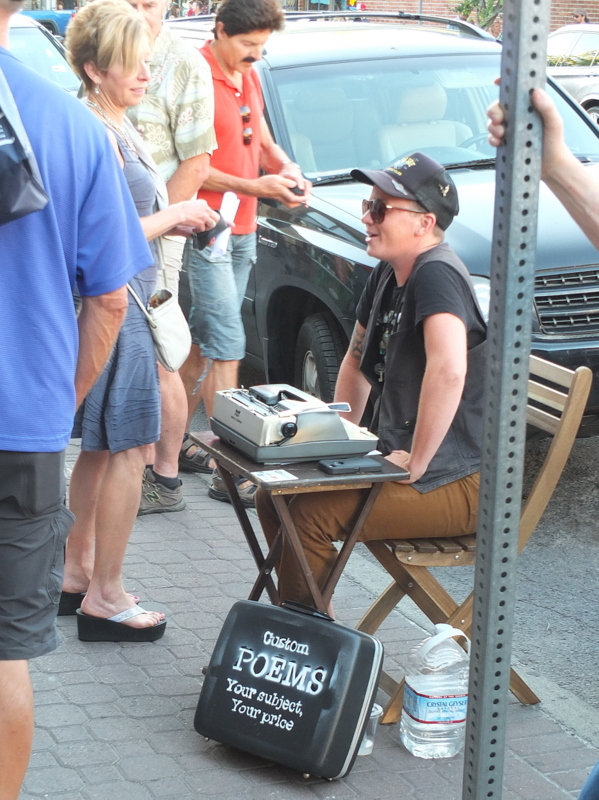 It was good to get out of the car/traffic as much as I could. 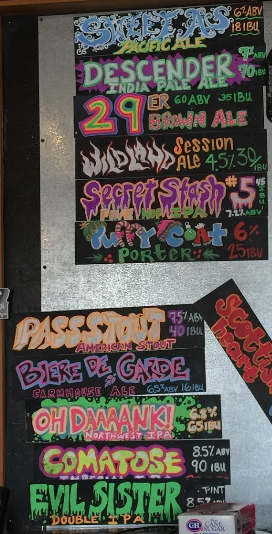 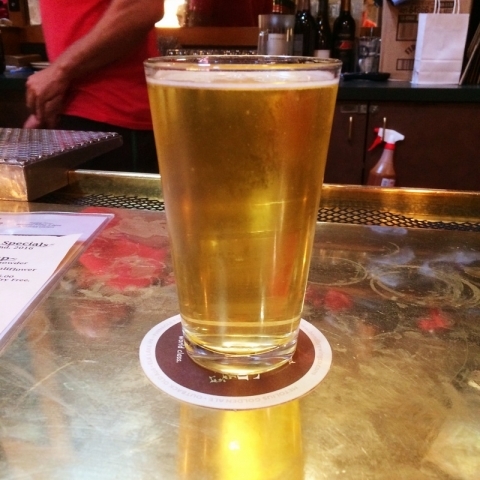 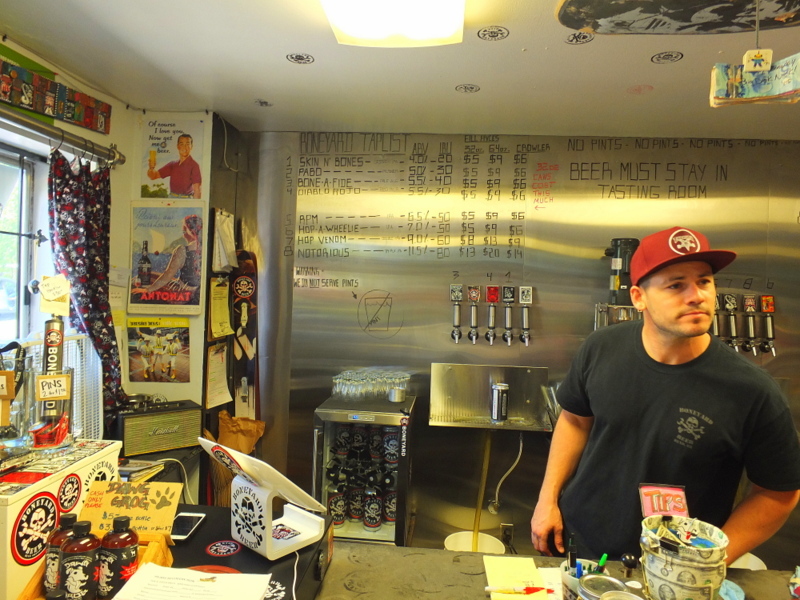 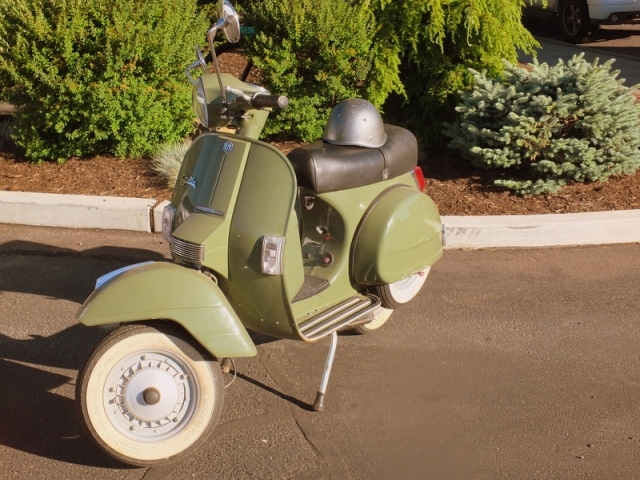 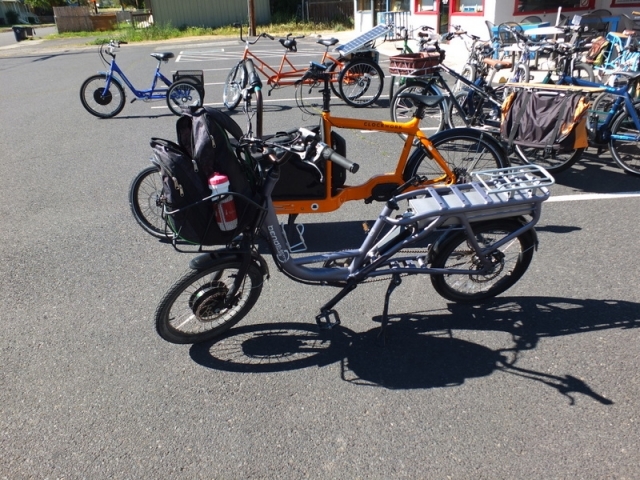 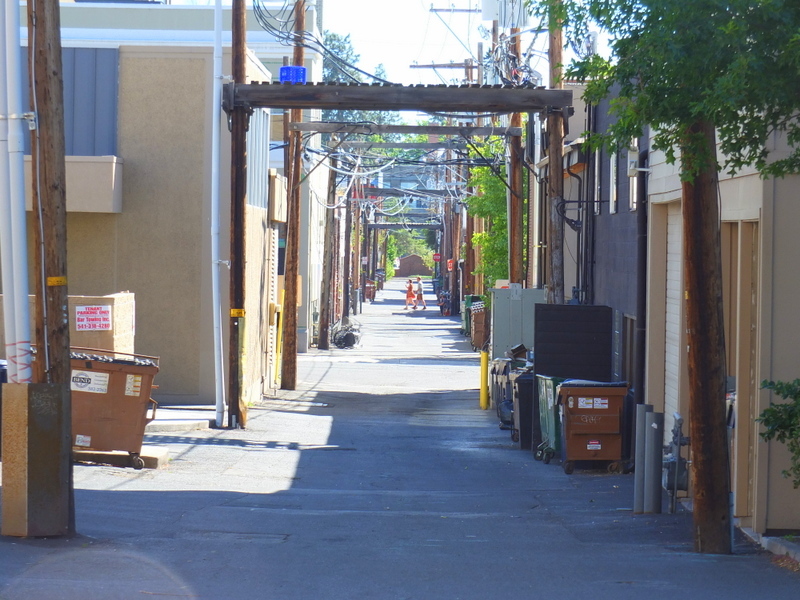 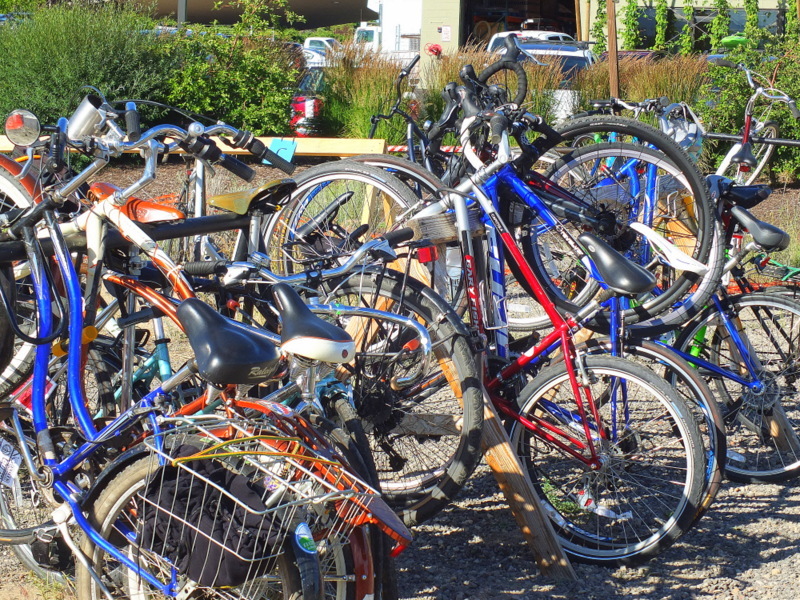 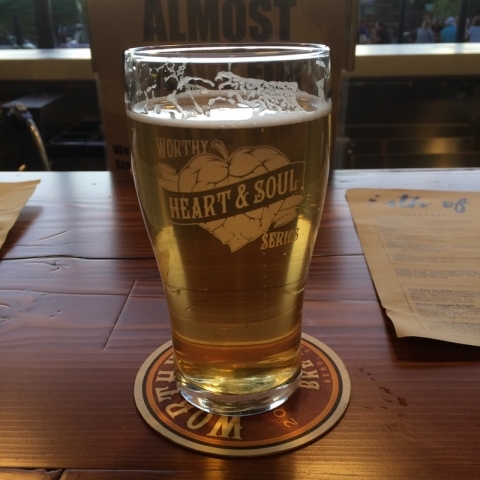 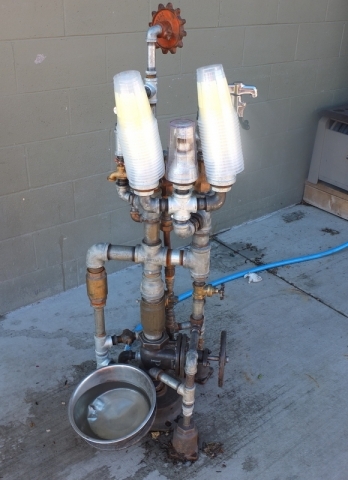 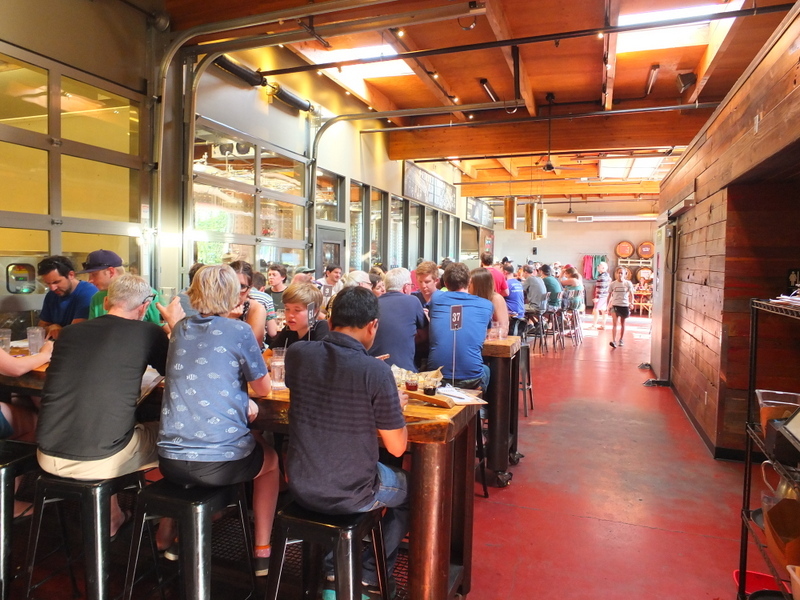 I found the downtown to be walkable, but to visit the breweries, a bike or e-bike is handy — the walks between the ones I visited weren’t particularly attractive. 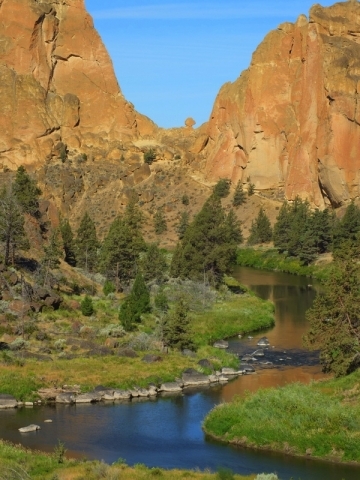 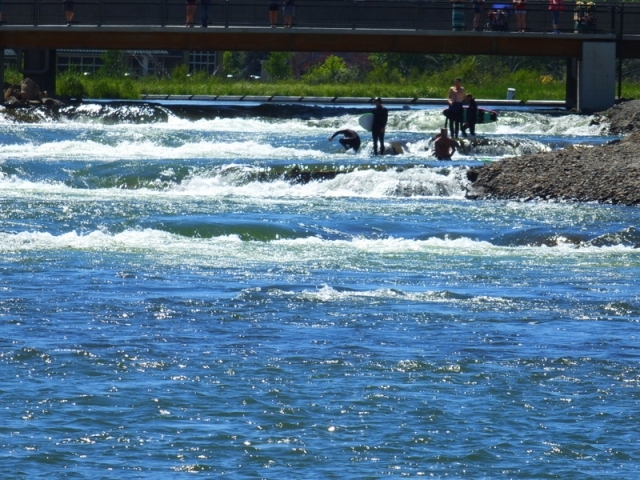 Bend is at an historic fording spot along the Deschutes River on the eastern flank of the Cascades Mountain range. 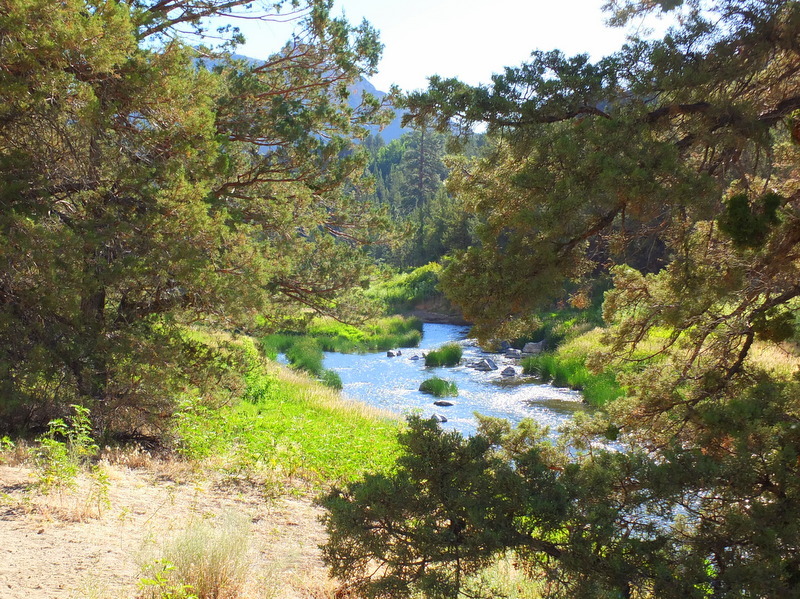 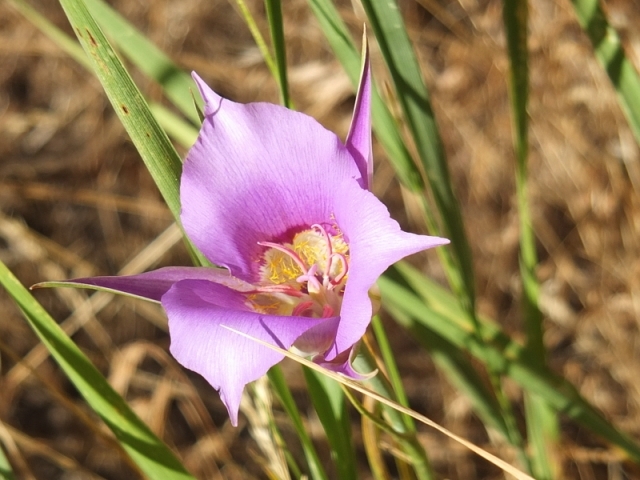 It is at a spot where Ponderosa Pine forest coming down from the mountains meet high desert landscape to the east. 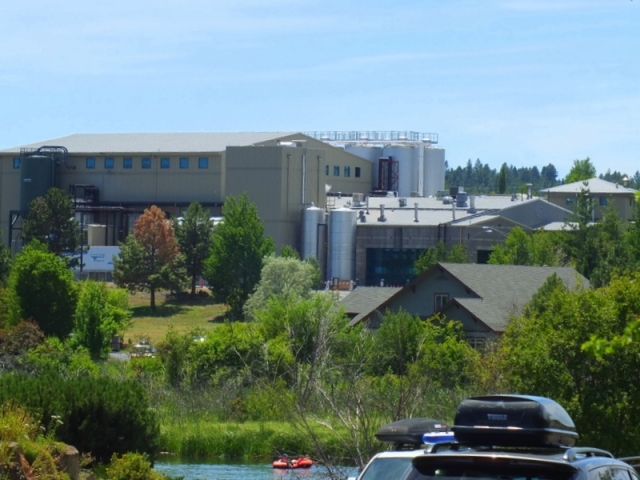 The breweries are spread out through the area. 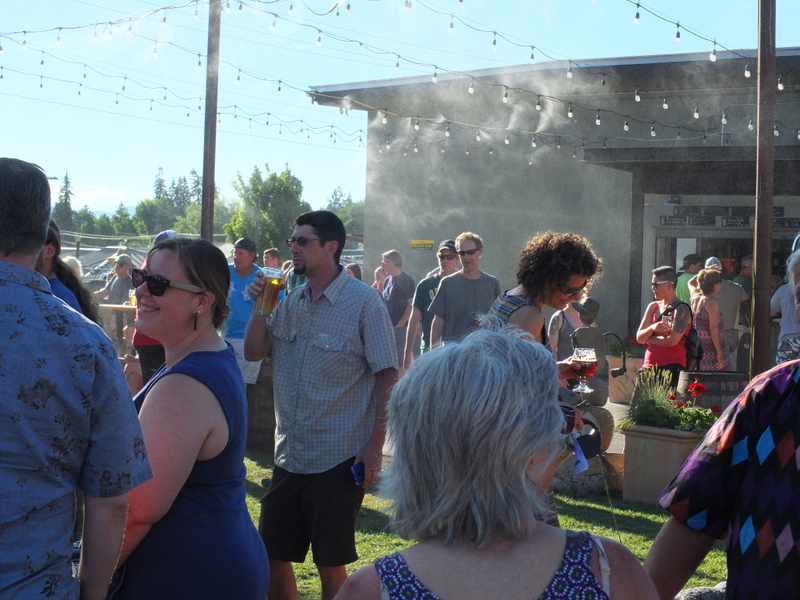 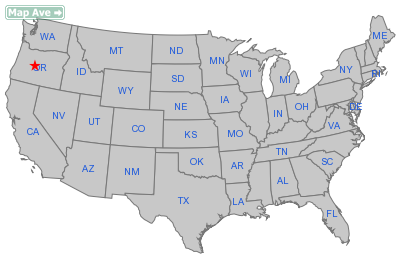 I have yet to see or hear a clear-cut count, but I’ve seen a number as high as 24 breweries throughout the region. 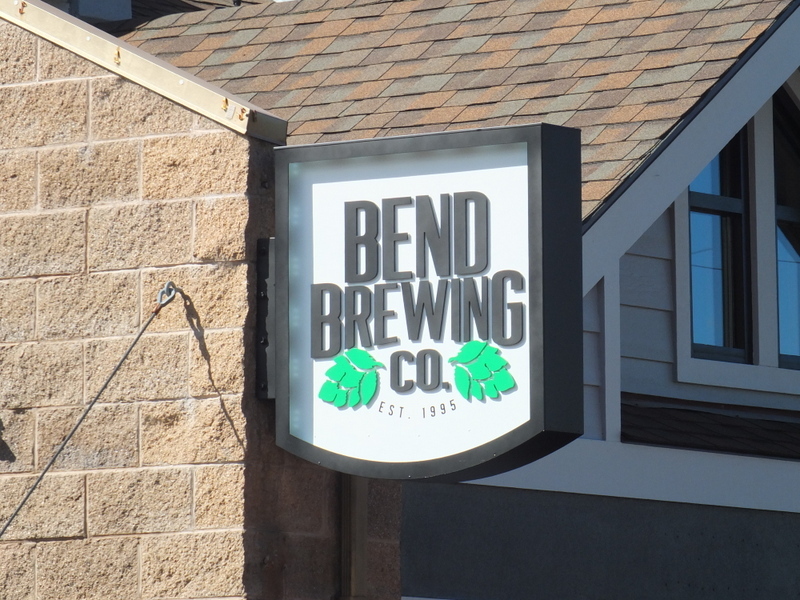 All of these aren’t in Bend-proper I don’t think. 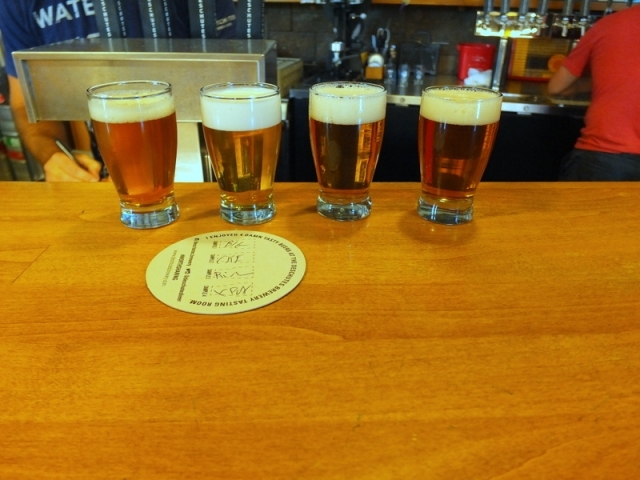 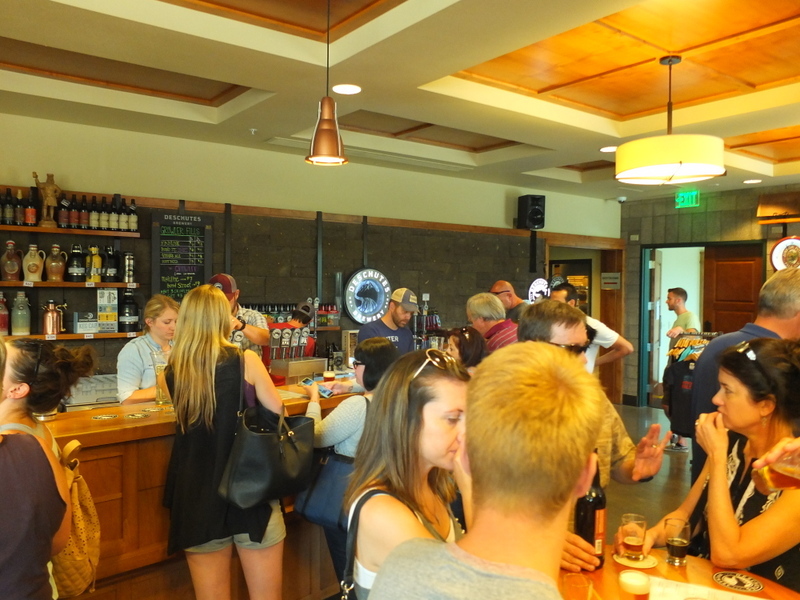 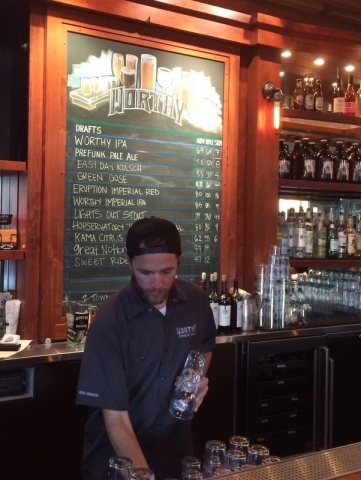 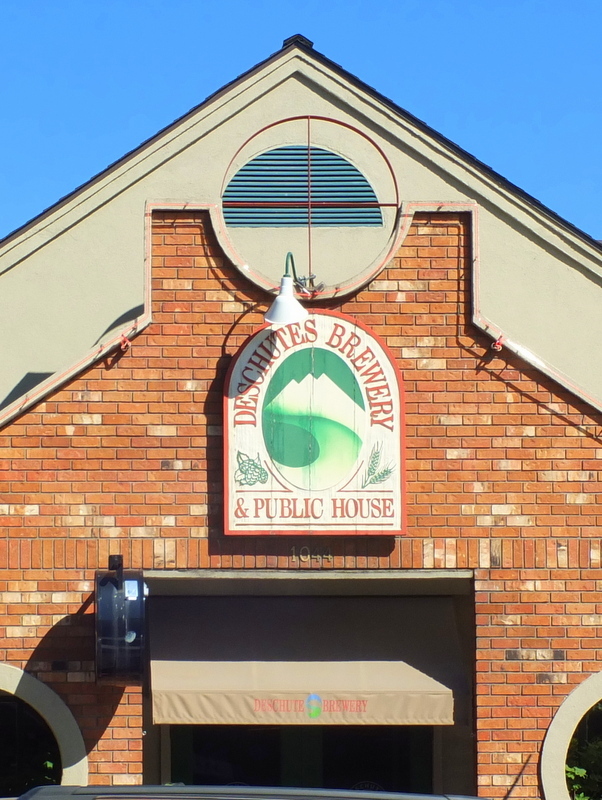 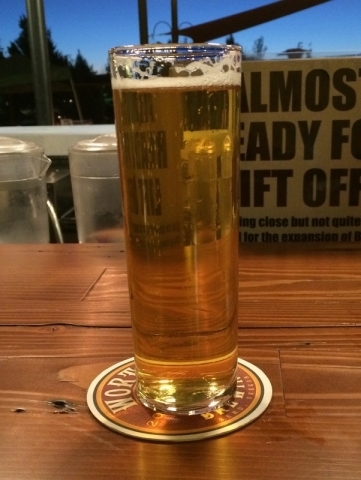 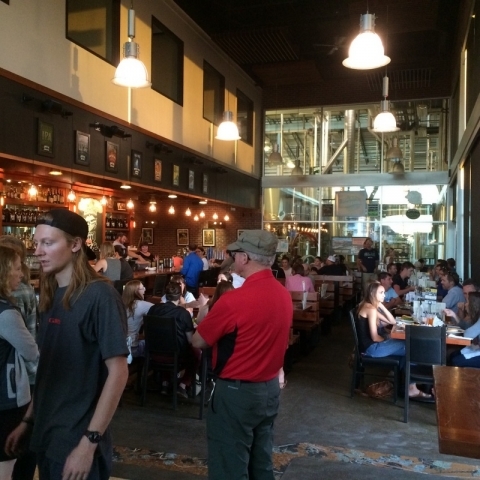 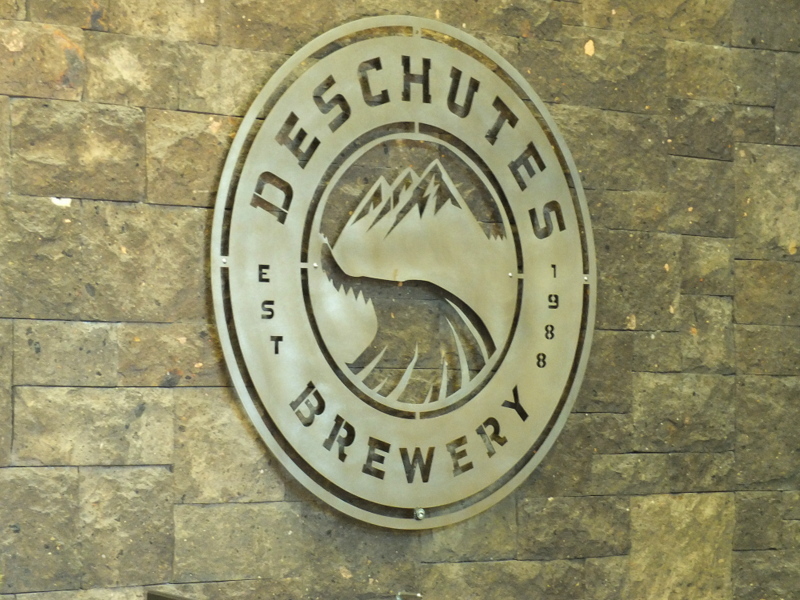 Deschutes Brewery would seem to be the mothership … definitely the flagship. 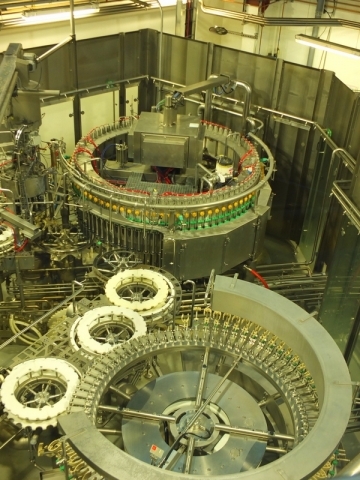 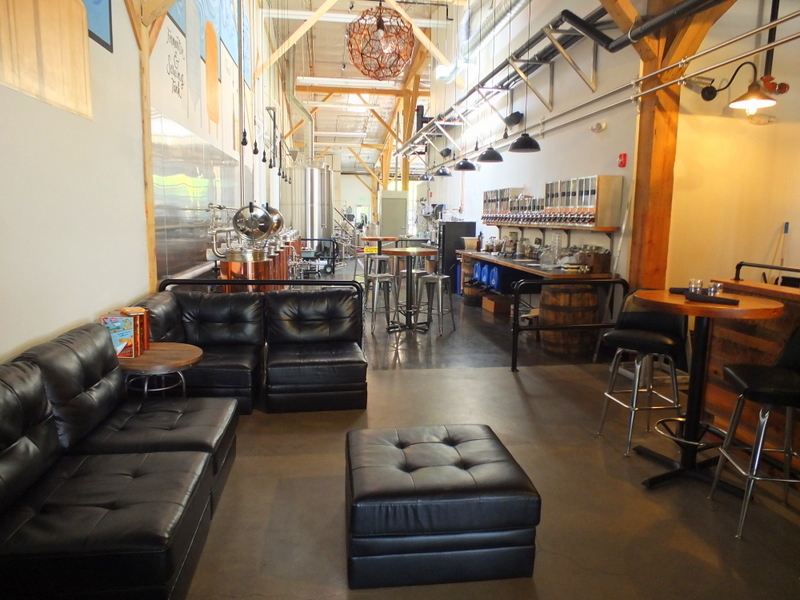 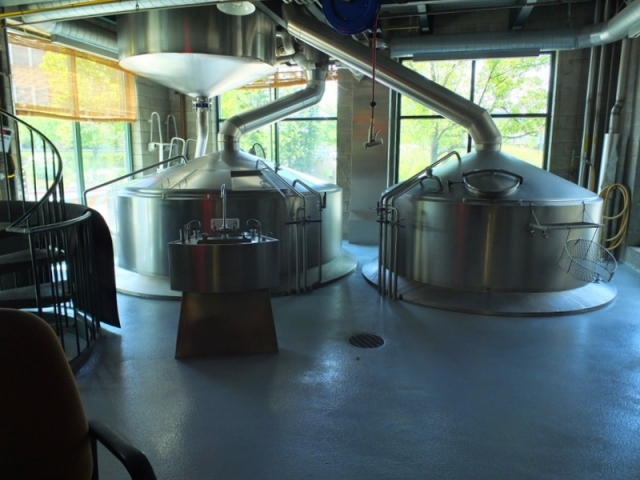 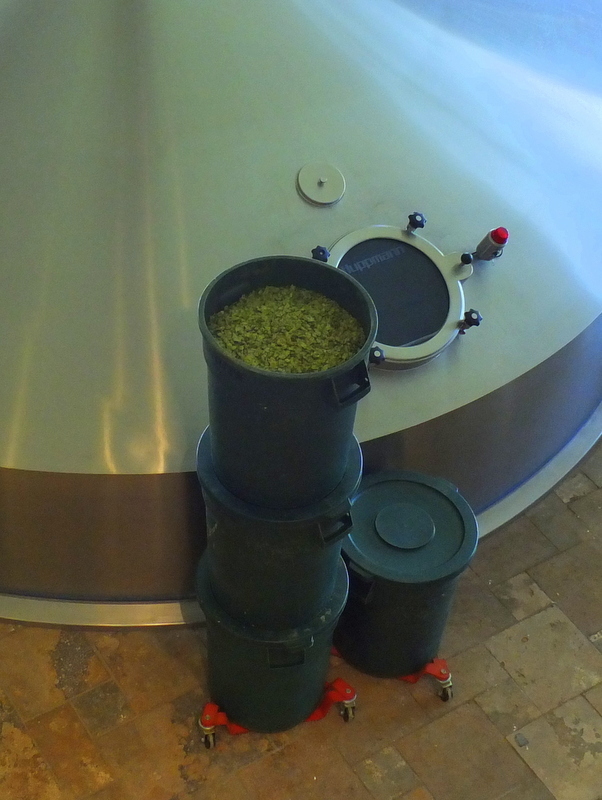 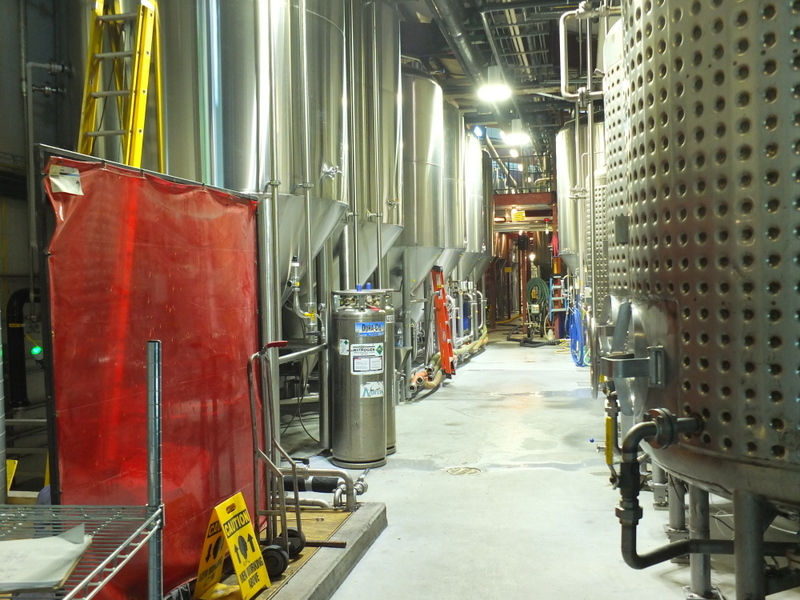 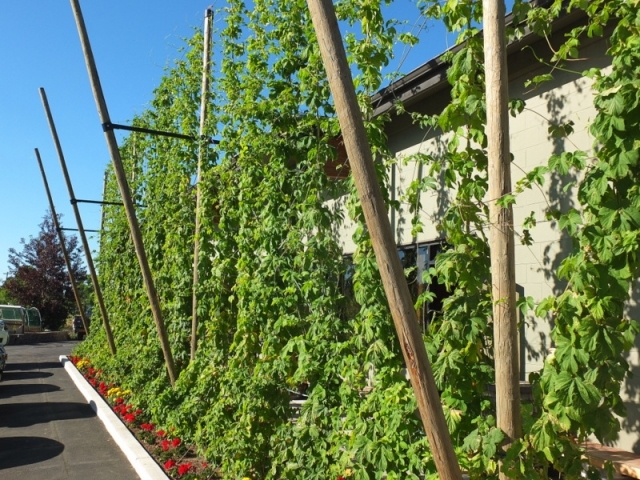 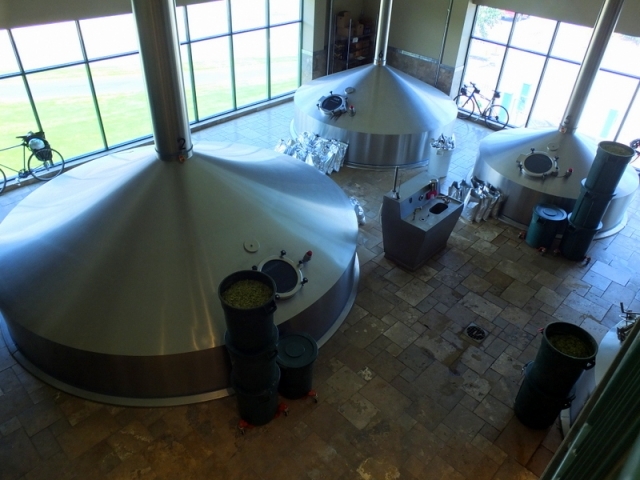 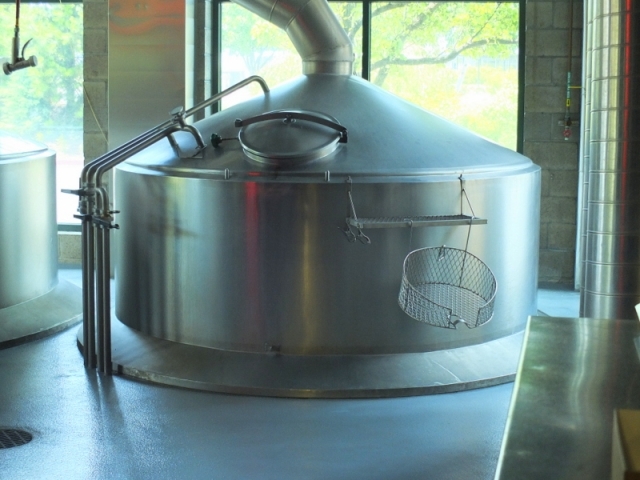 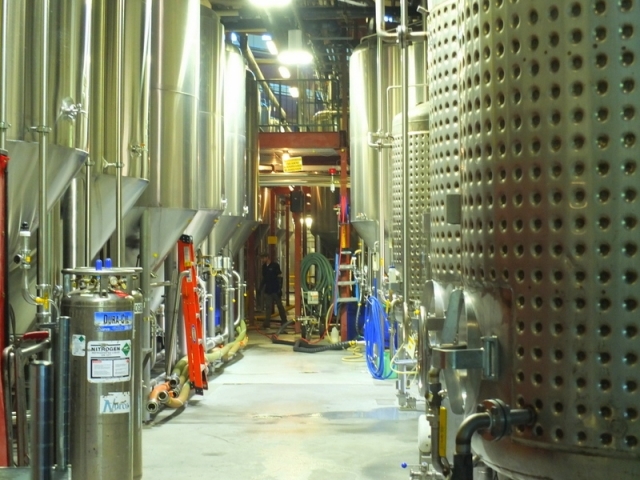 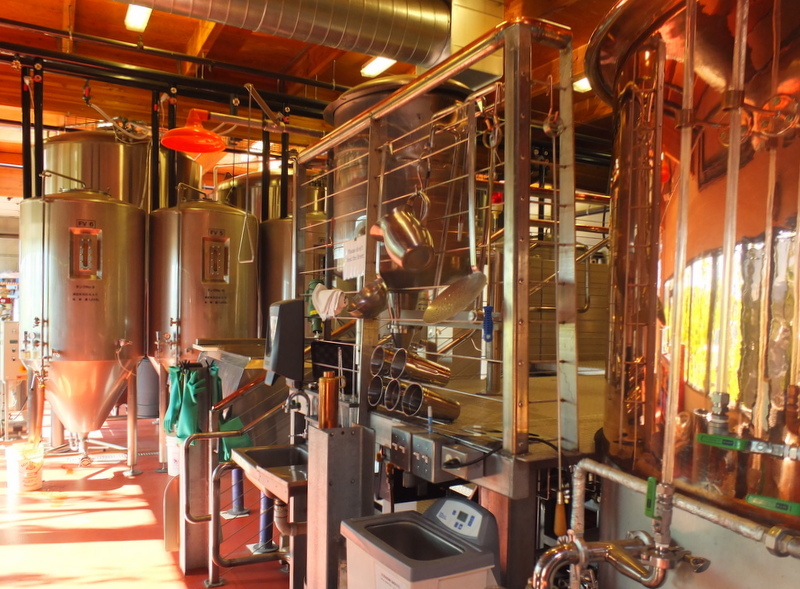 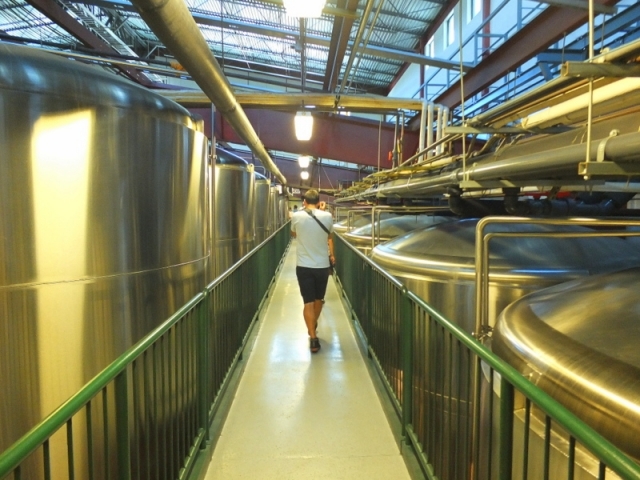 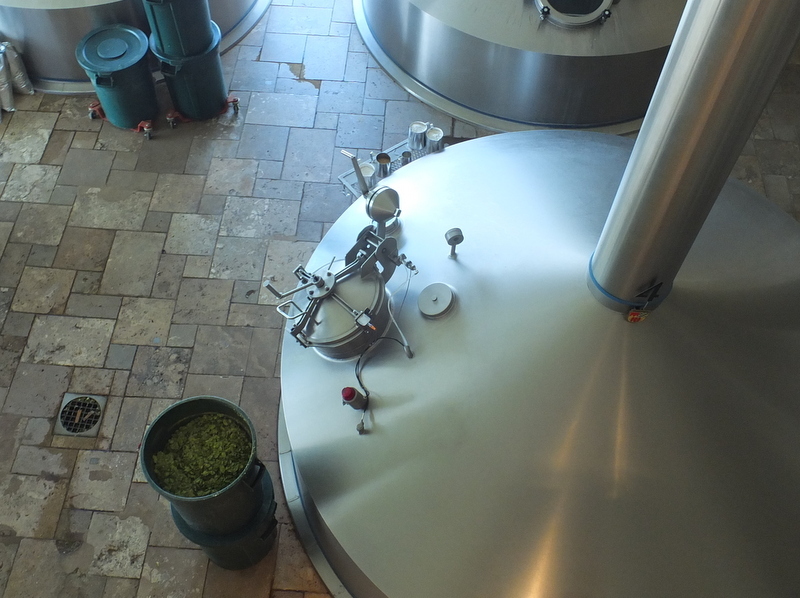 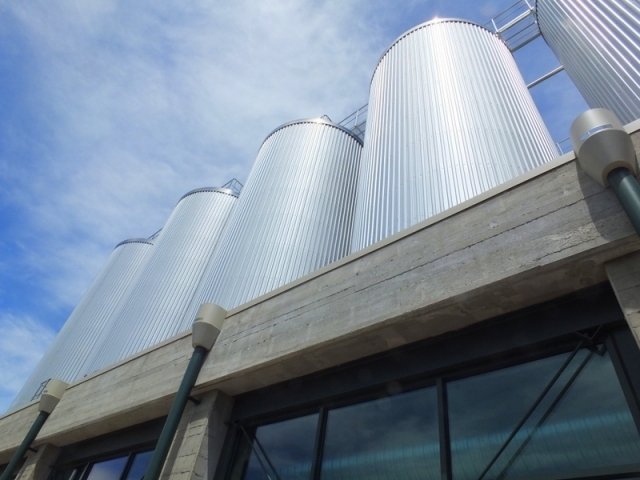 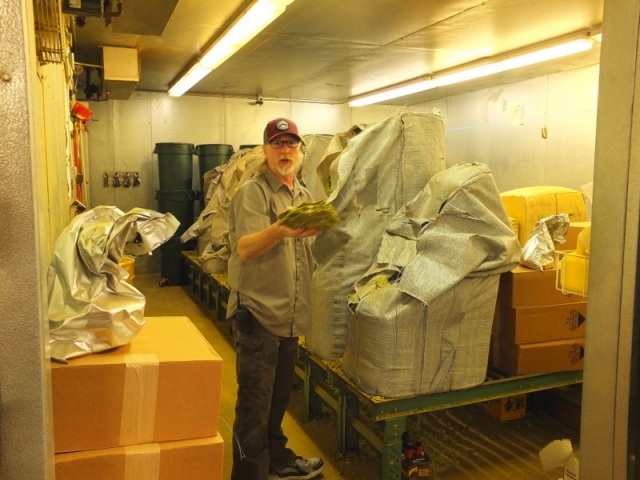 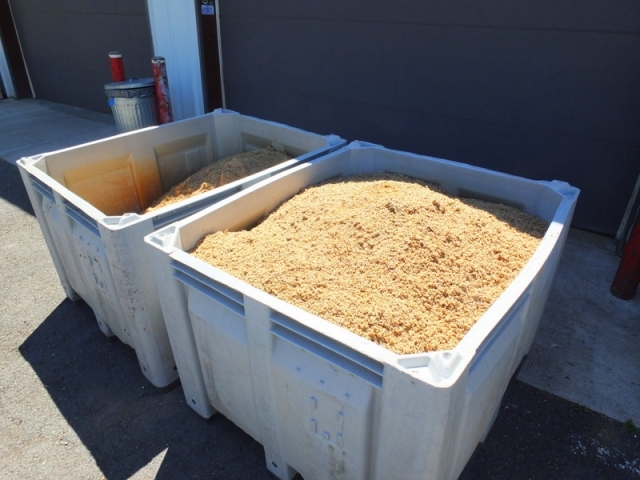 It is a big brewery in a modern facility. 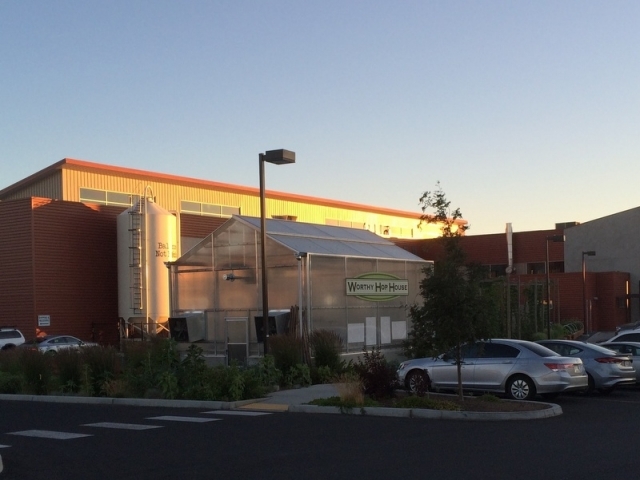 As I understand it, they are employee-owned and the employee I spoke to was a pretty happy worker. Deschutes also has a taproom in an old place downtown that I guessed may be their original location. 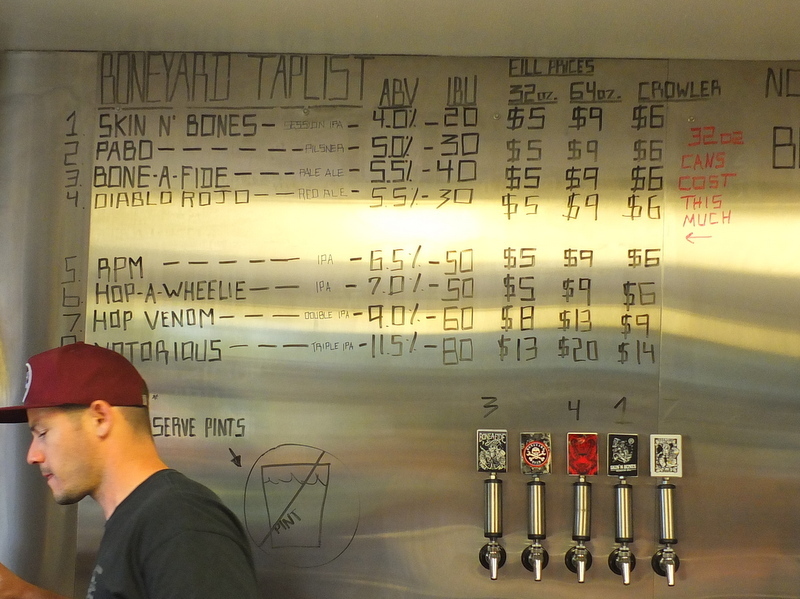 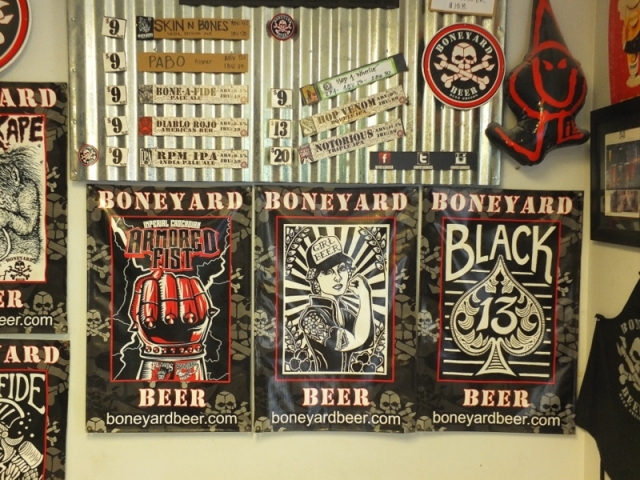 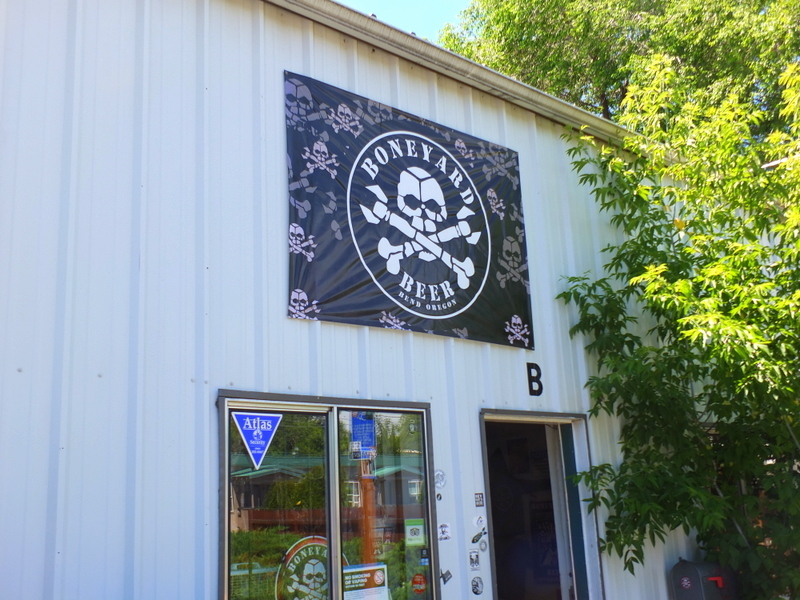 At the other end of the spectrum of architectural snazziness is Boneyard Brewing Company in an old garage in a mostly residential area — I did enjoy the beer. 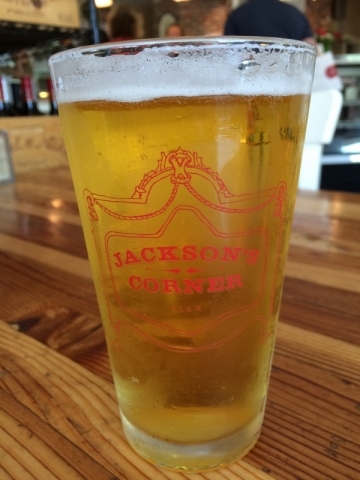 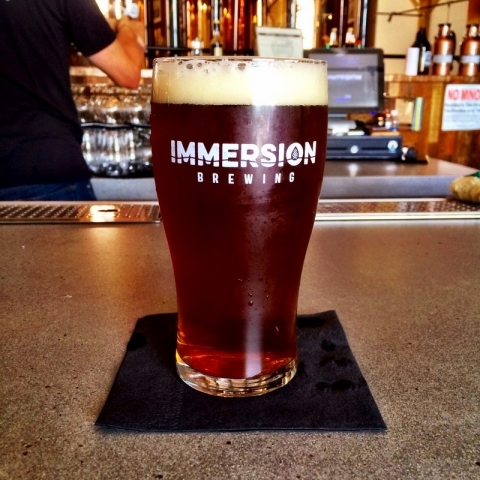 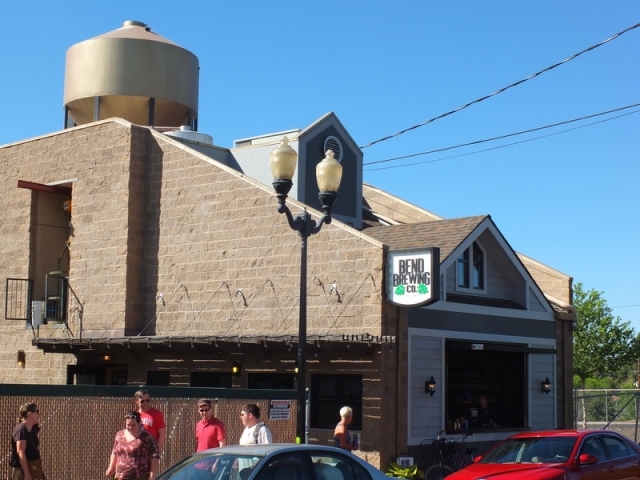 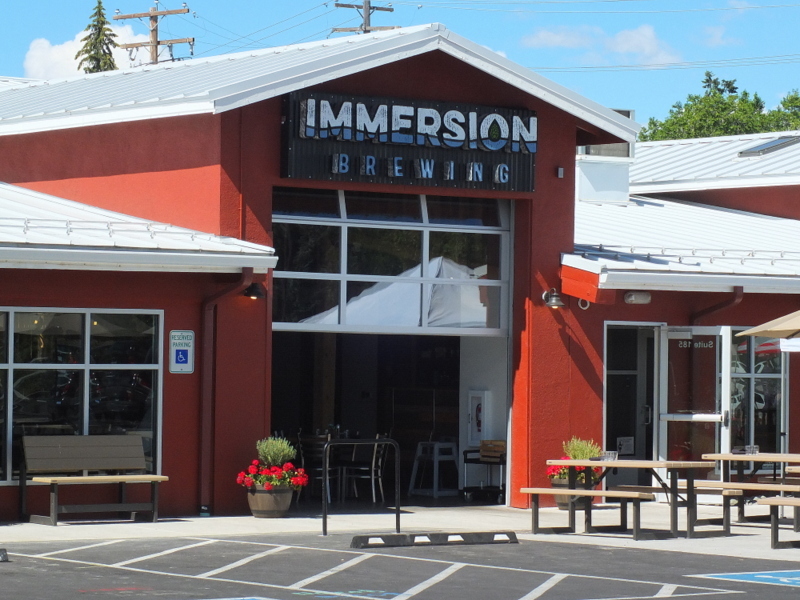 Several of the breweries fall into a category I call “seems to be a brewery because it is good marketing for a restaurant”. 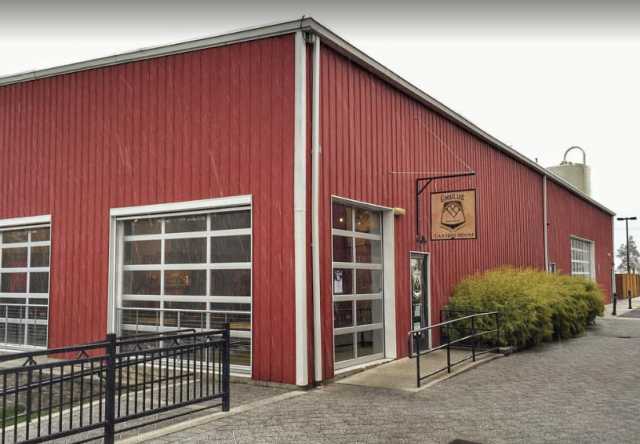 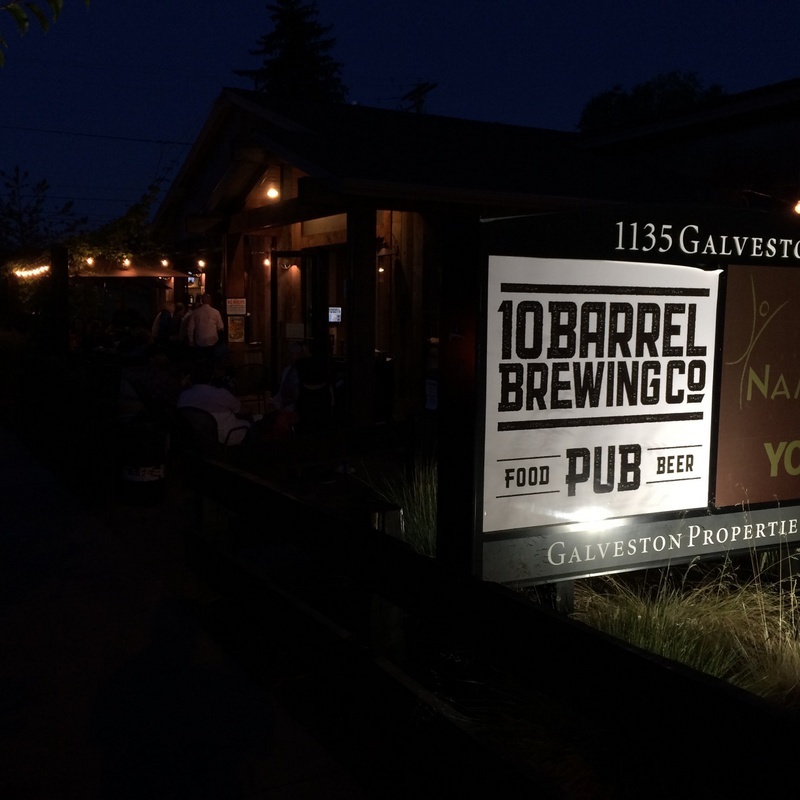 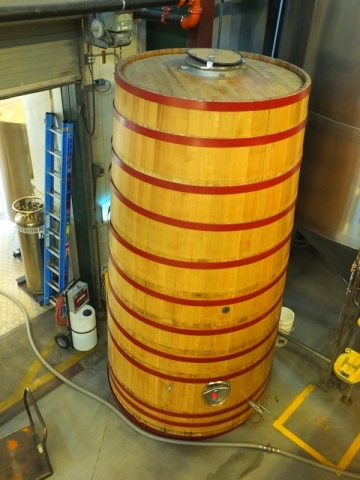 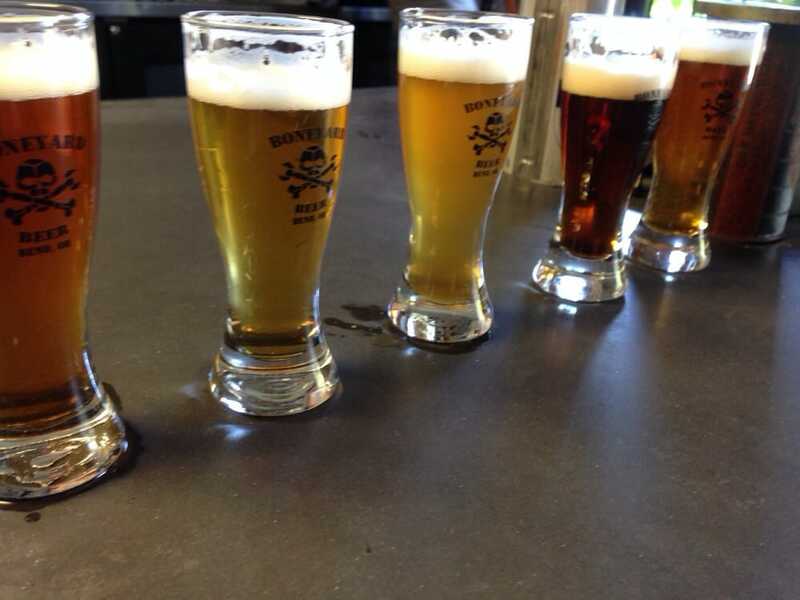 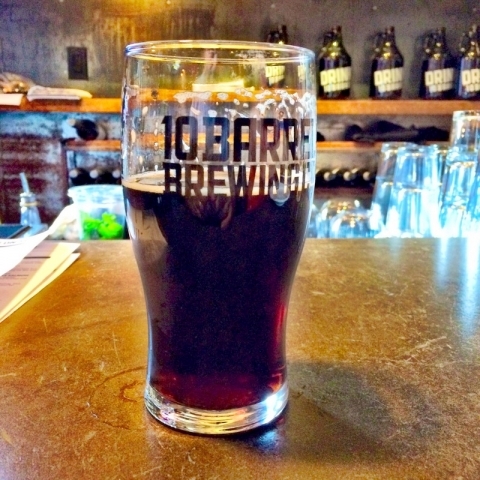 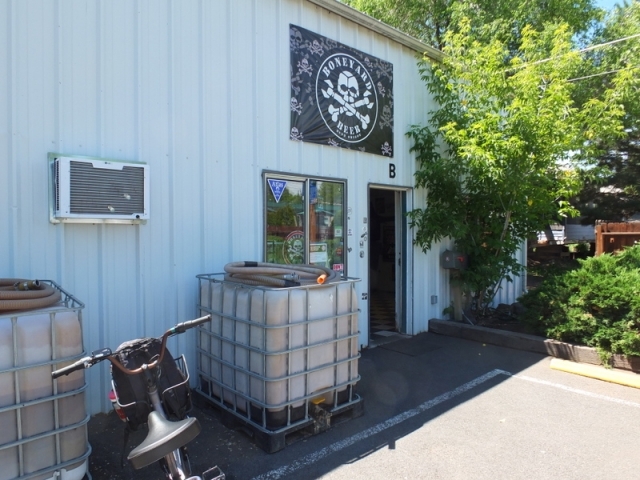 10 Barrel Brewing started in Bend as I understand it but is now owned by Anheuser-Busch and has branches in Boise, Denver, and maybe other places. 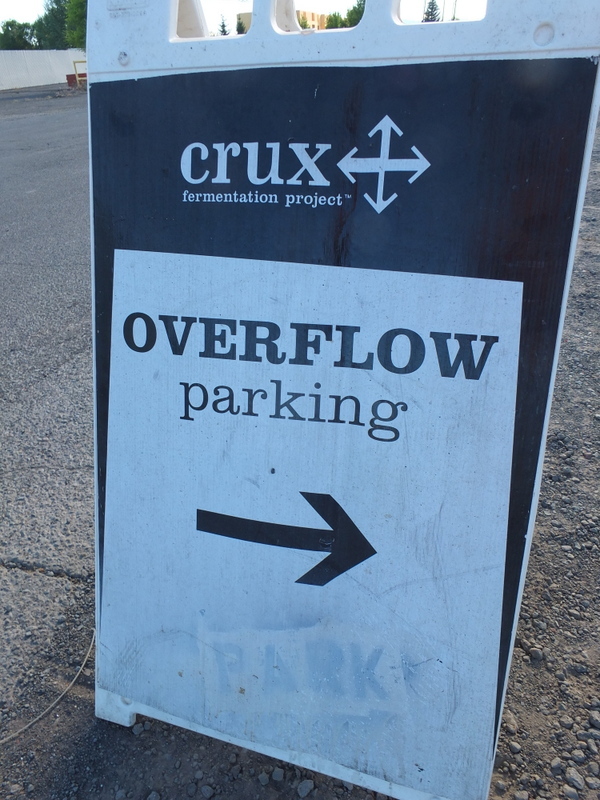 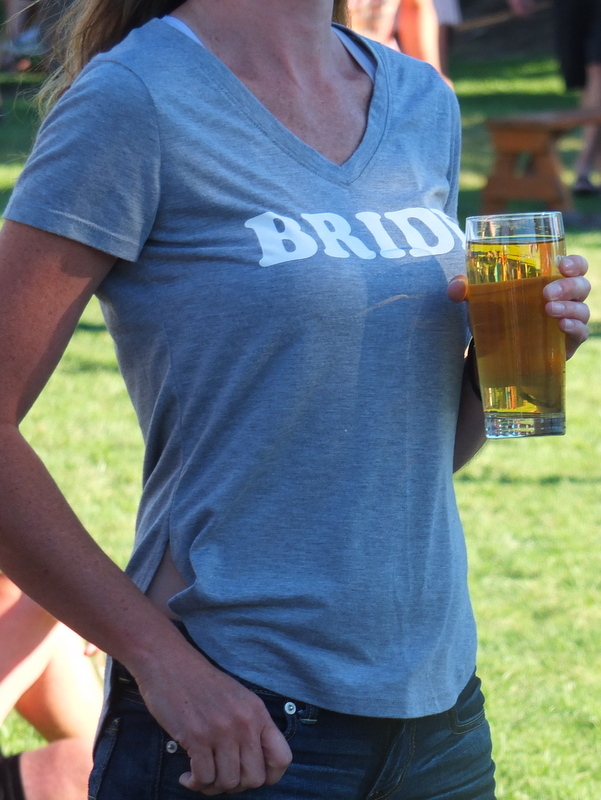 I would have to say that my favorite place and beer had to be at the Crux Fermentation Project. 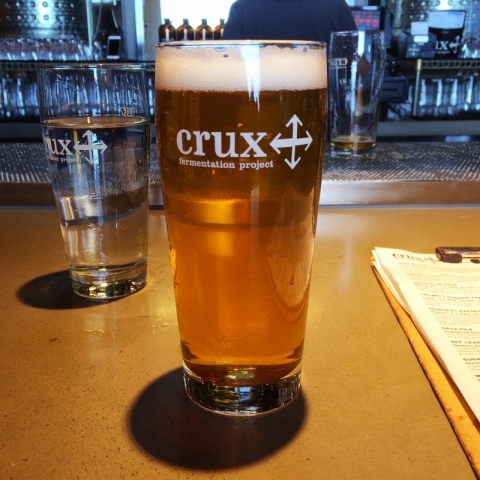 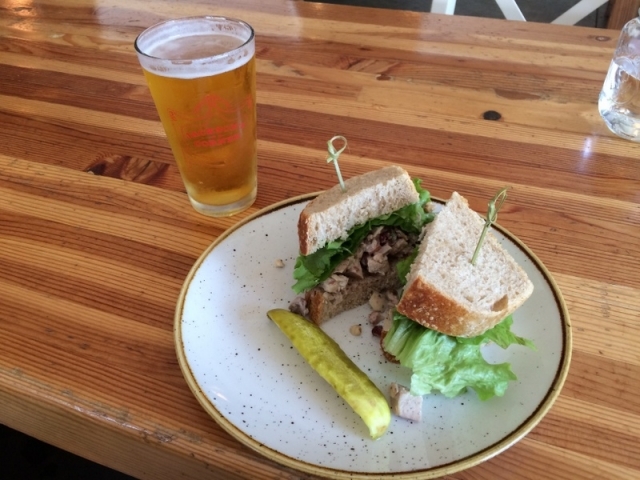 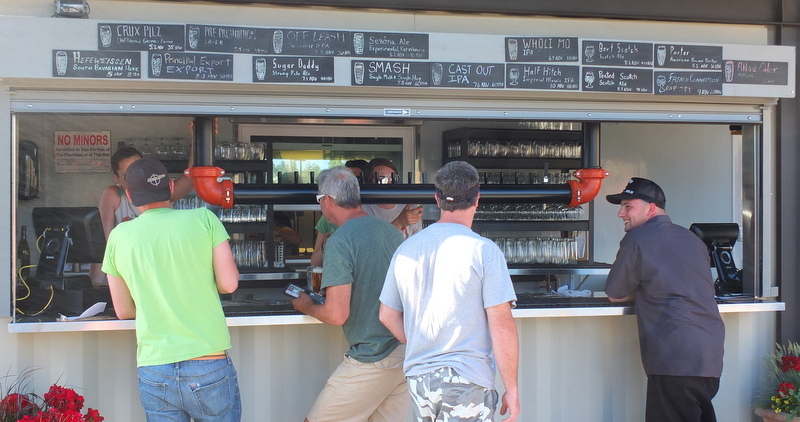 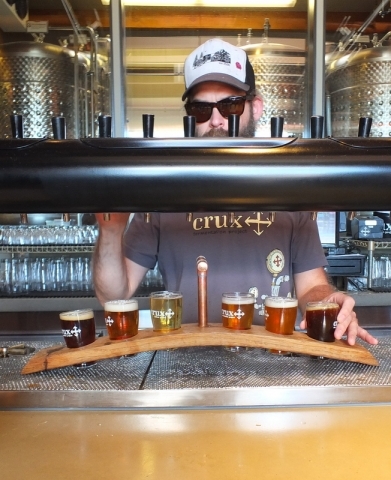 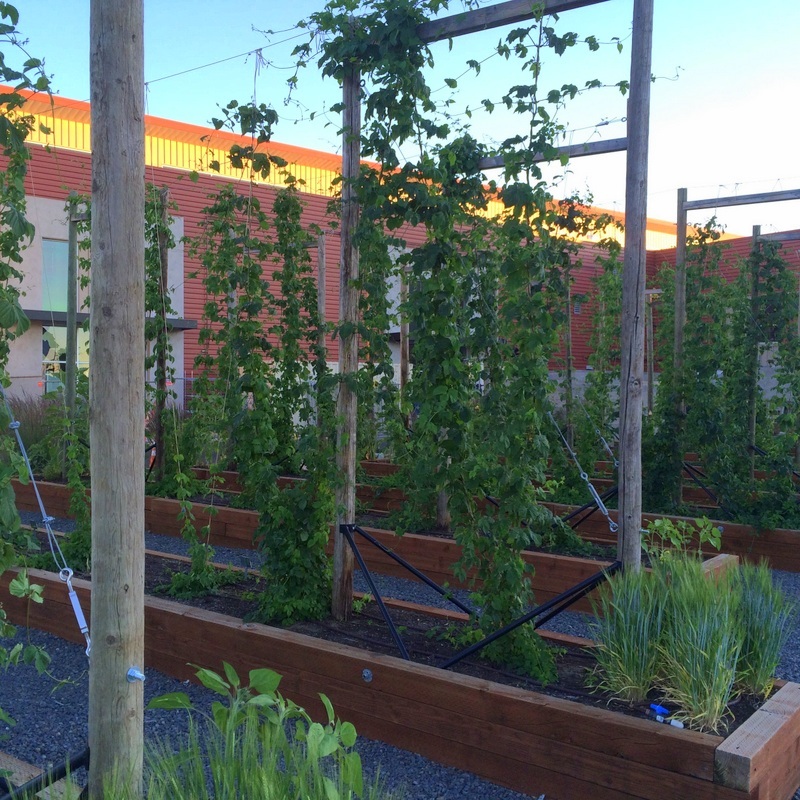 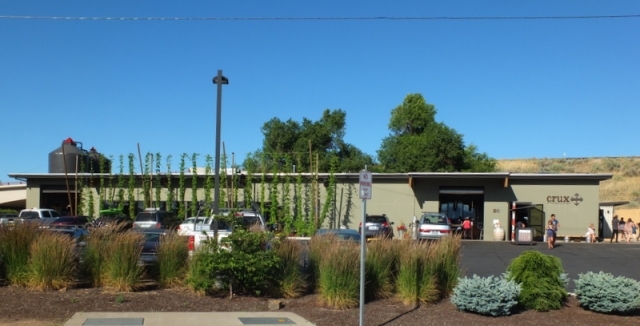 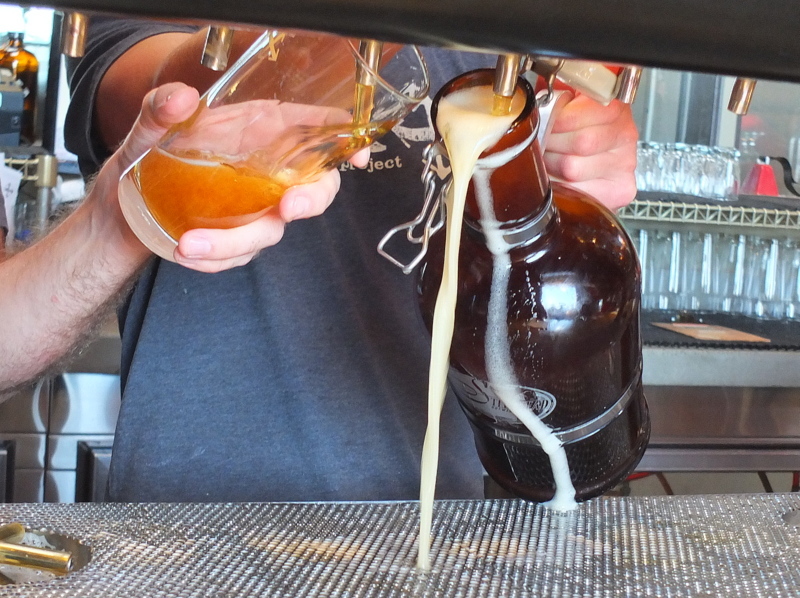 Crux is an oasis within a fairly ugly industrial area — the taproom and brewery is industrial chic and a large outdoor lawn is a venue for beer, music, and comfortable picnicking. 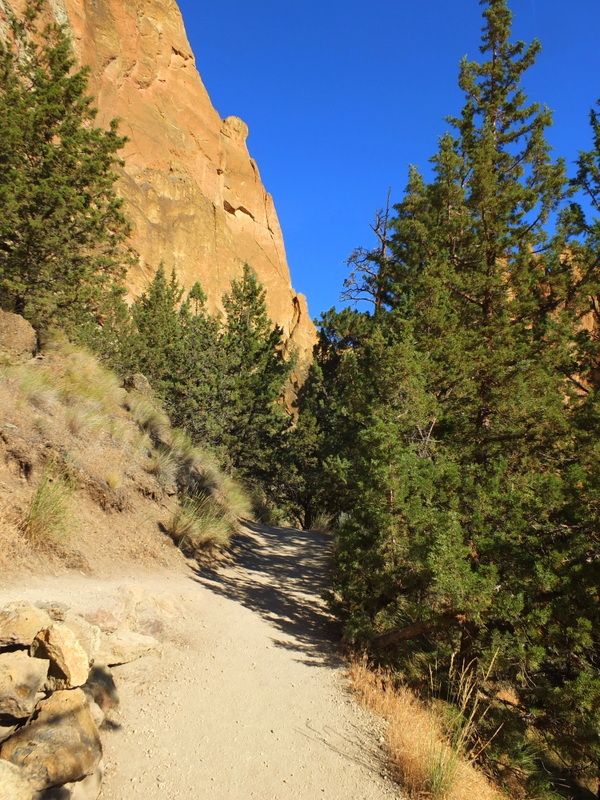 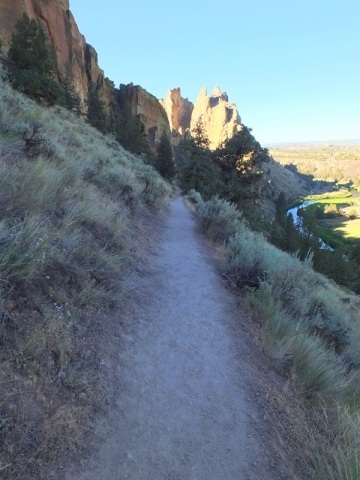 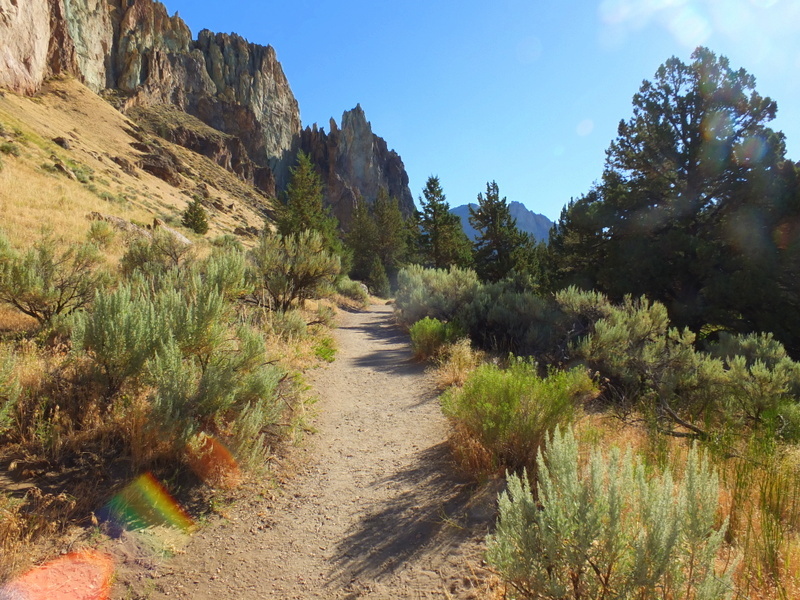 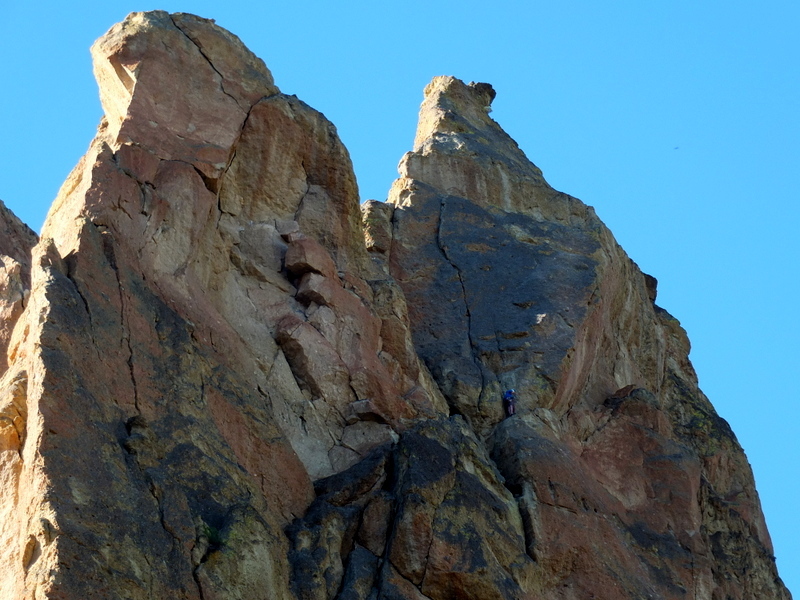 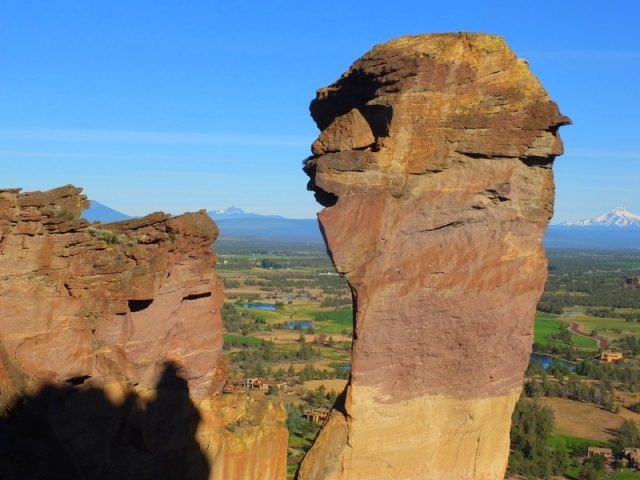 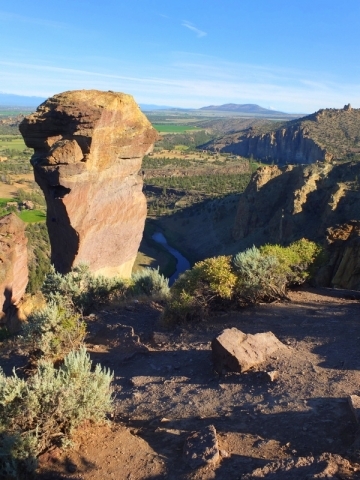 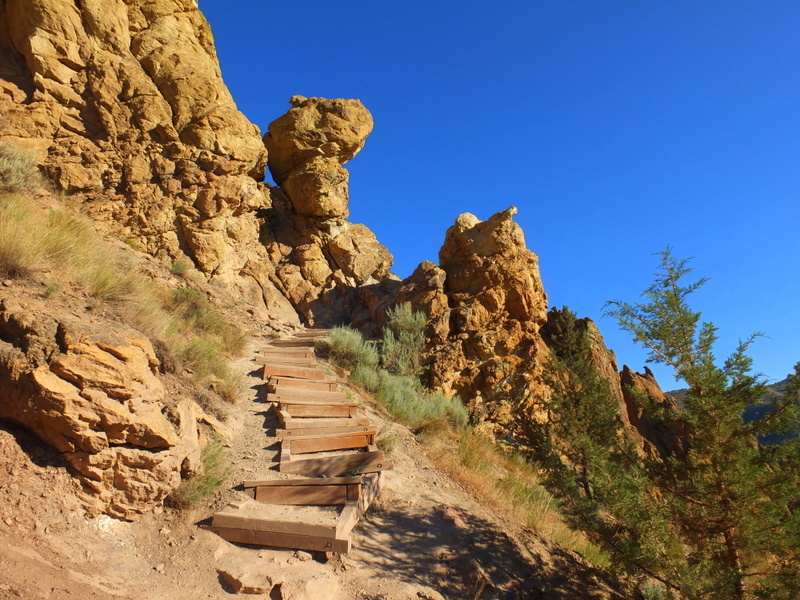 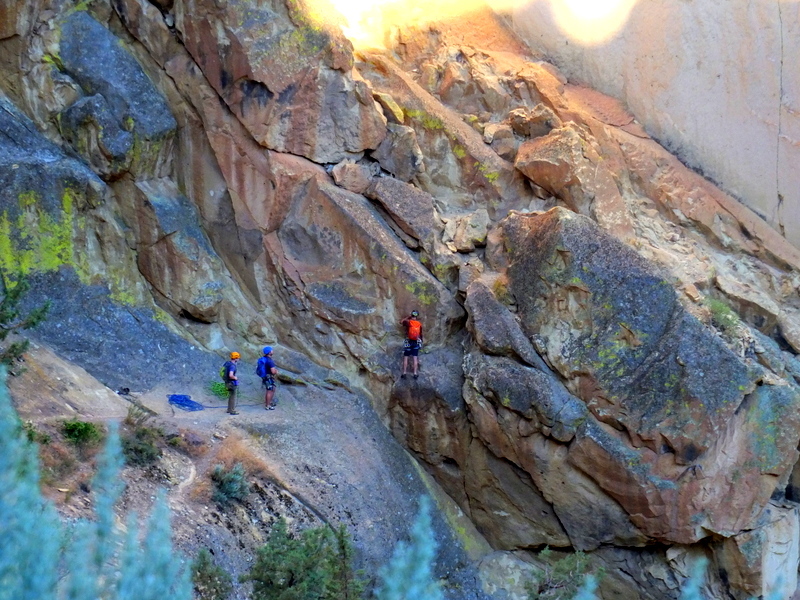 No one I asked locally came up with particularly interesting ideas for hikes originating in town,but Smith Rock consistently came up as a recommended hiking place. 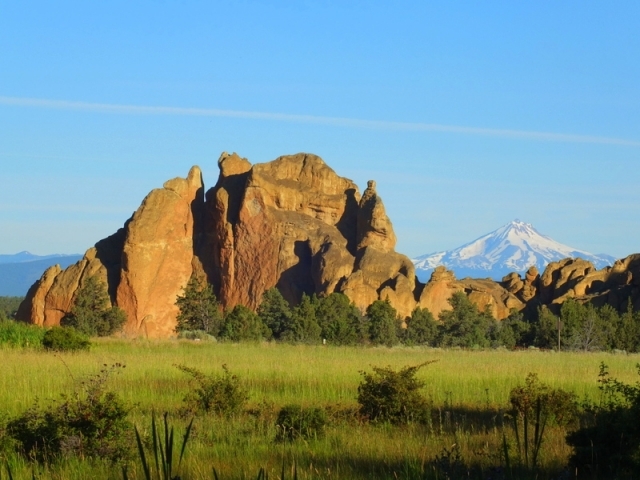 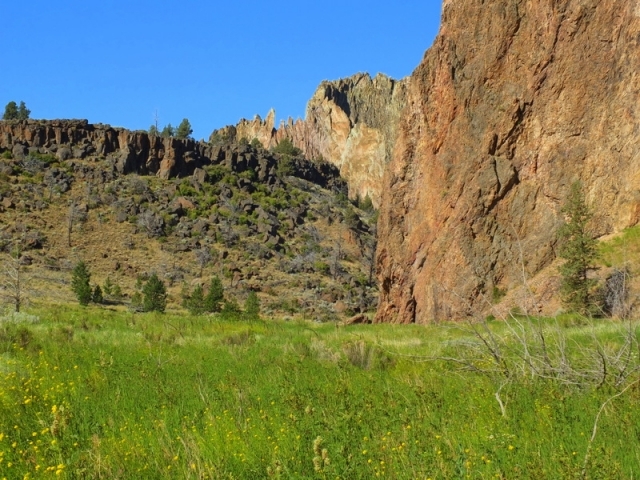 Smith Rock State Park is a half hour drive north of Bend through suburbs and agricultural land. 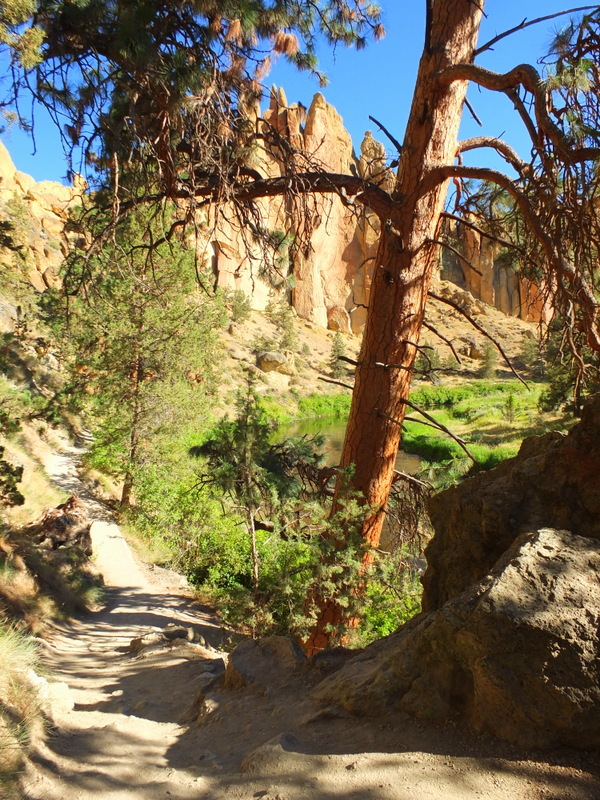 Once you get there, the view turns to the spectacular and I found the loop hike to be greatly enjoyable. 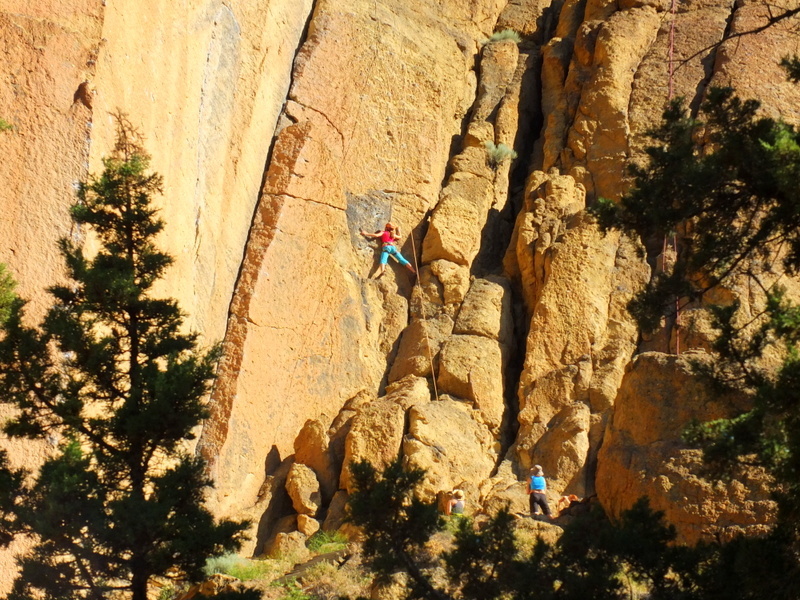 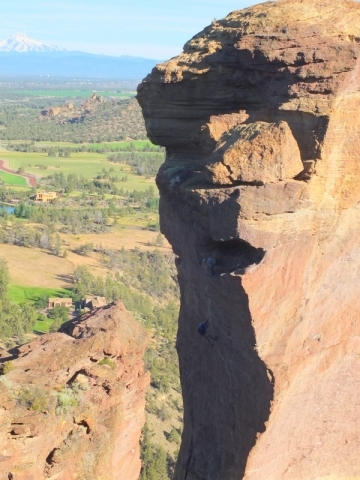 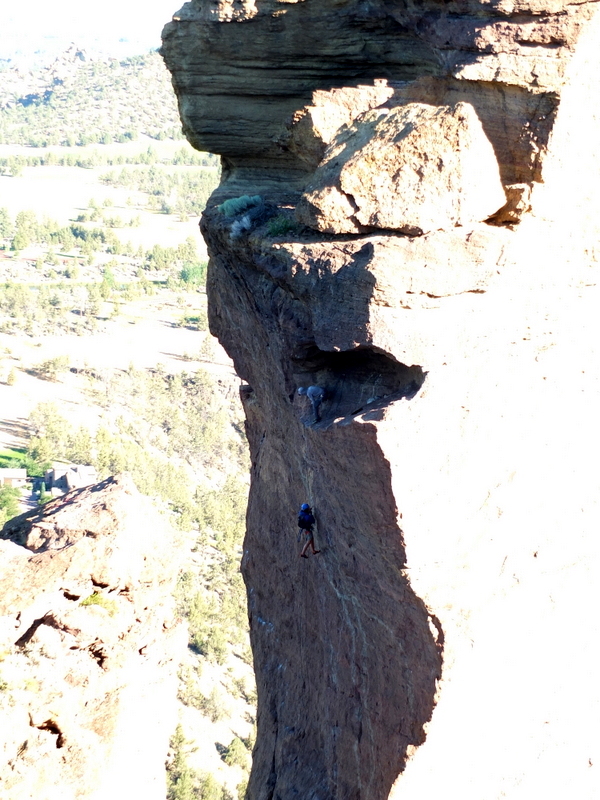 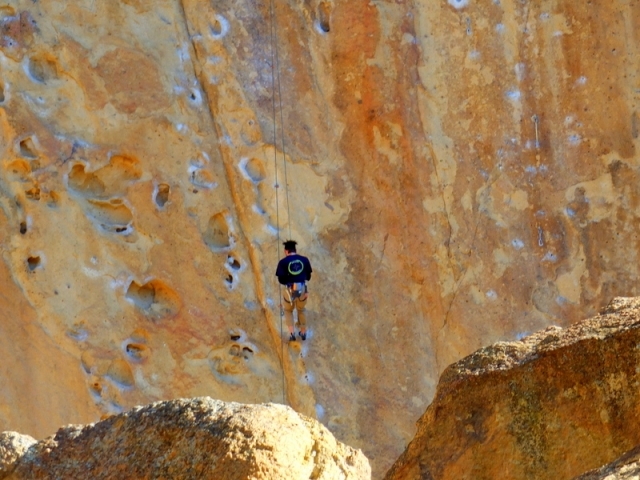 Smith Rock turns out to be an important destination in the rock climbing world and it’s amusing to see people hanging off of major rock faces. 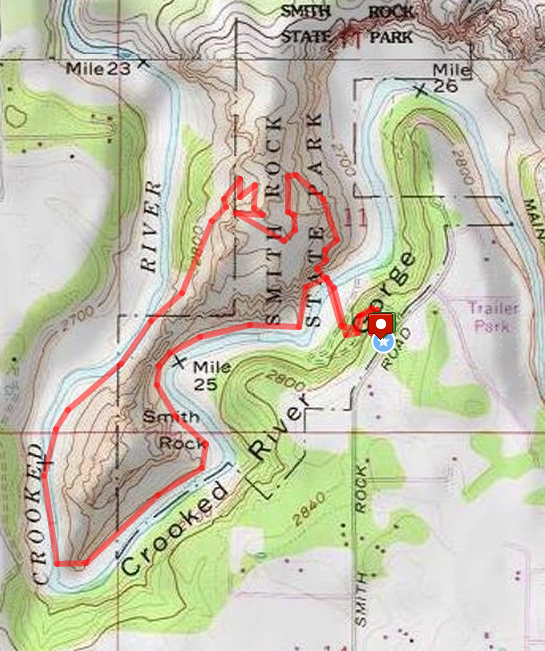 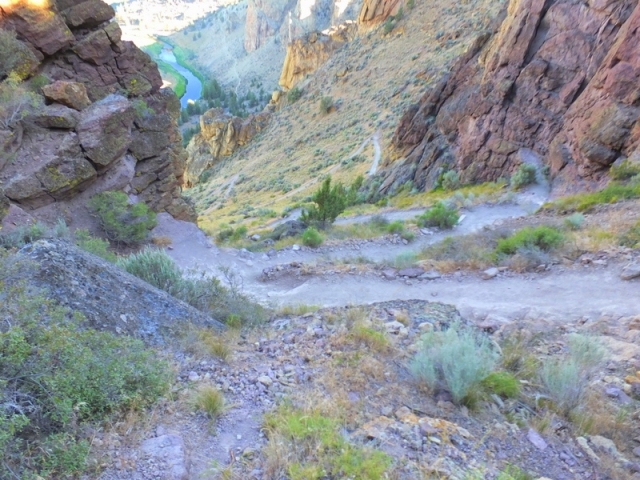 From the parking area the trail descends down to the Crooked River where the loop splits. 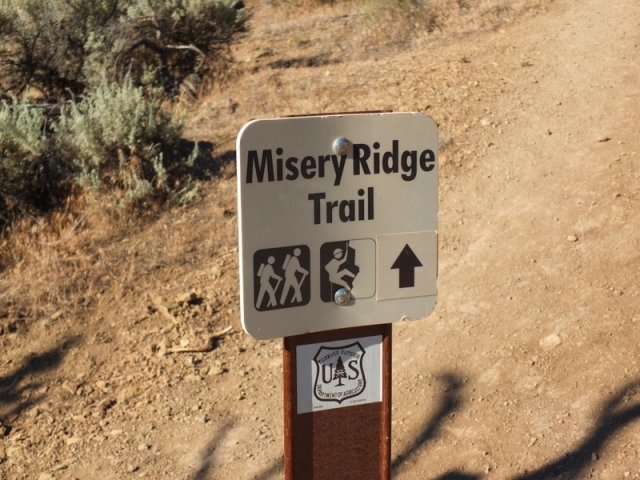 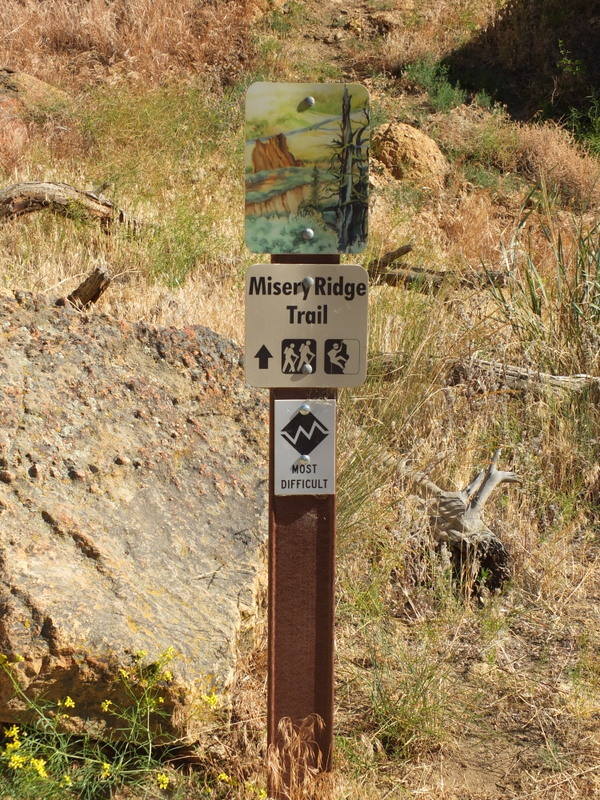 I chose the uphill first following the Misery Ridge trail on a steep ascent. 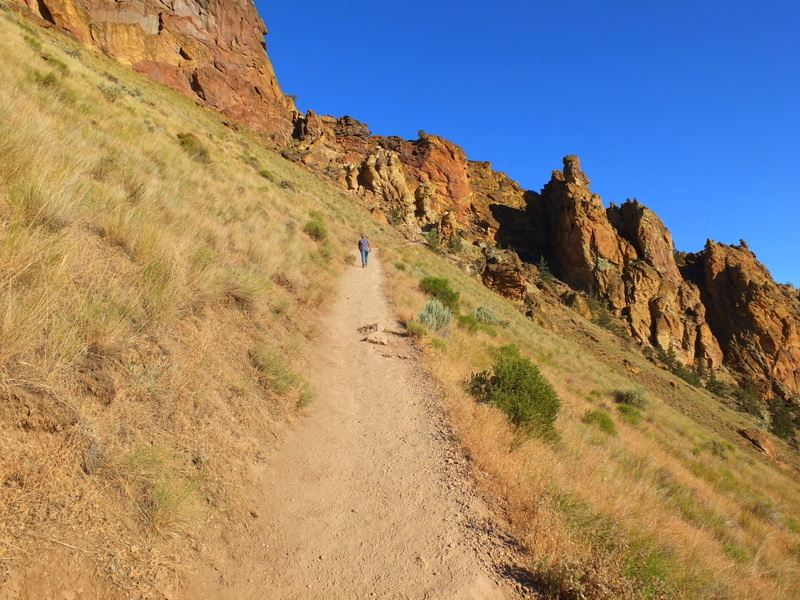 It was sunny and hot going up, but as soon as I crested it was back into the cool shade. 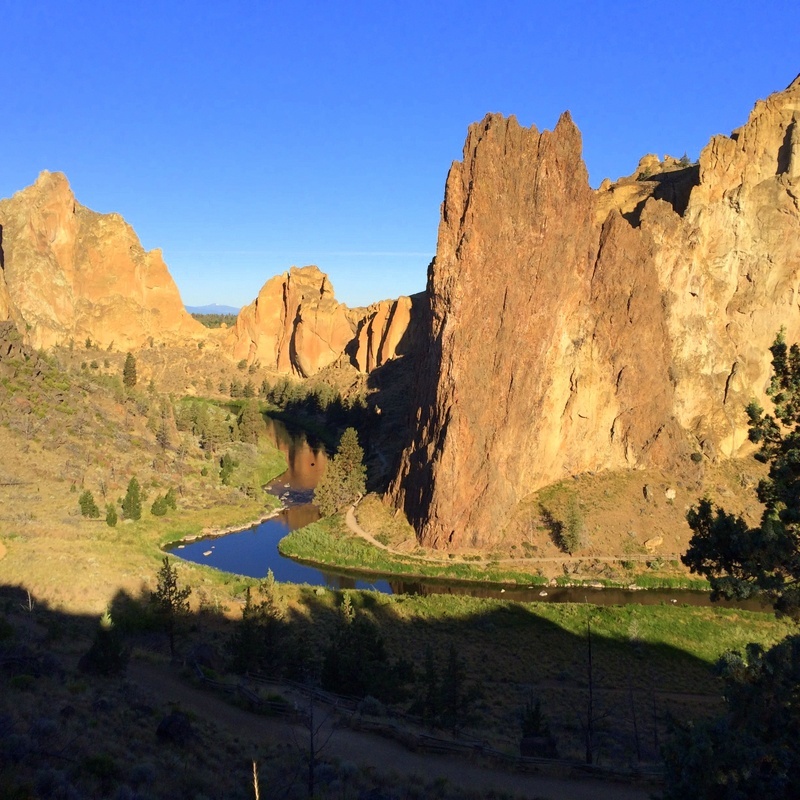 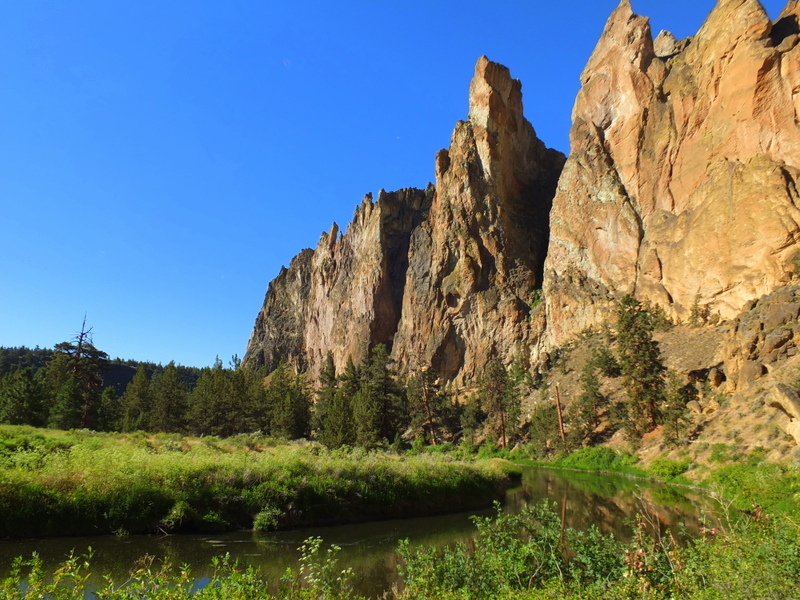 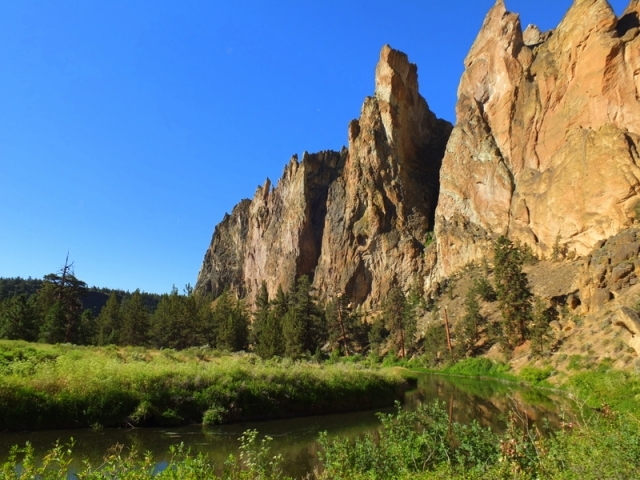 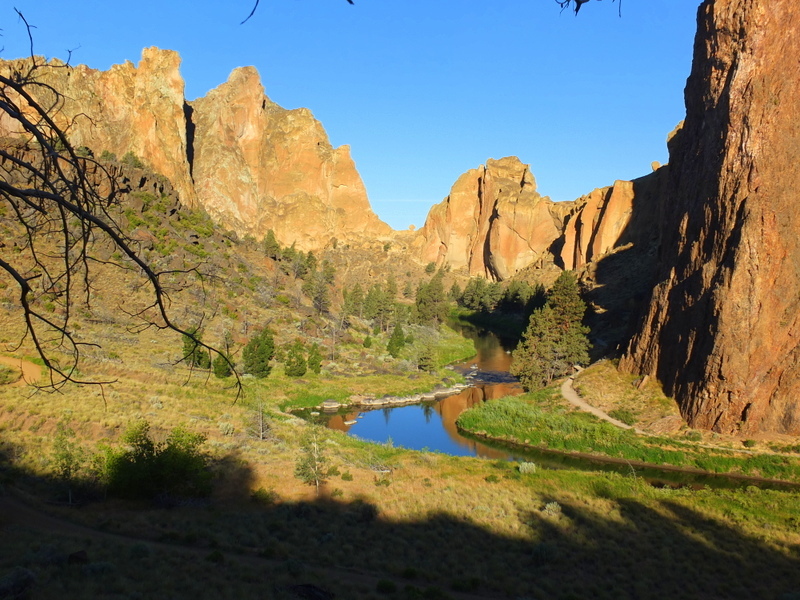 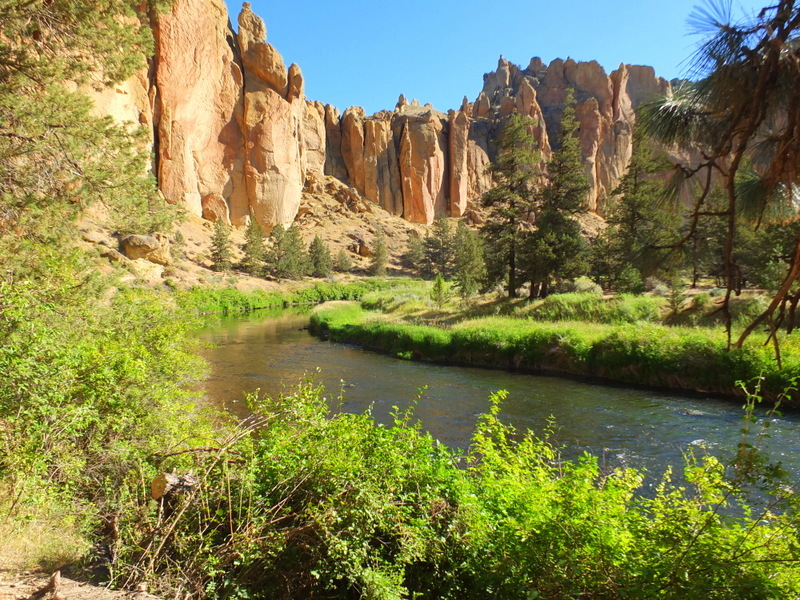 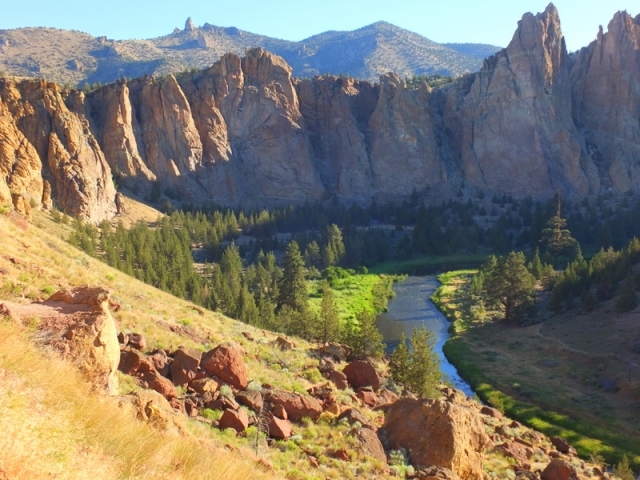 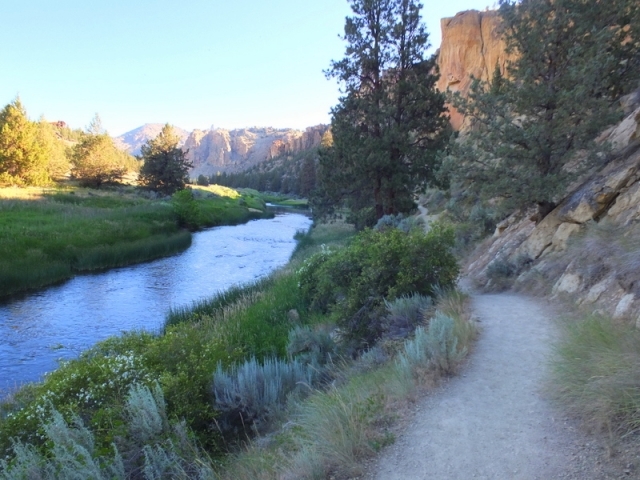 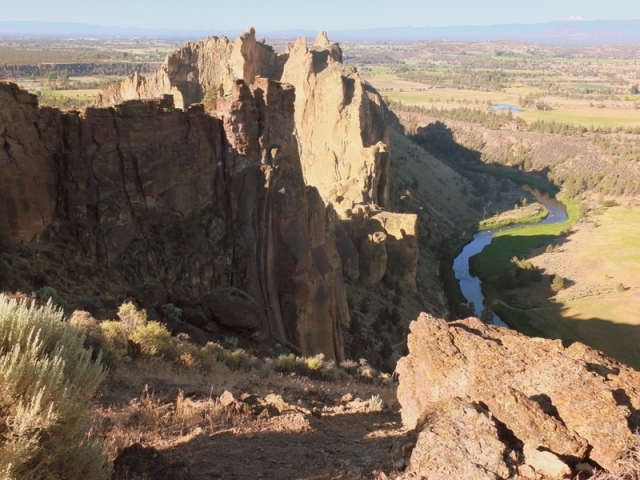 The Crooked River curls around Smith Rock, so after a steep descent you follow the river all the way back to your starting point. The hike to Sisters Mirror Lake is a very different kind of route. 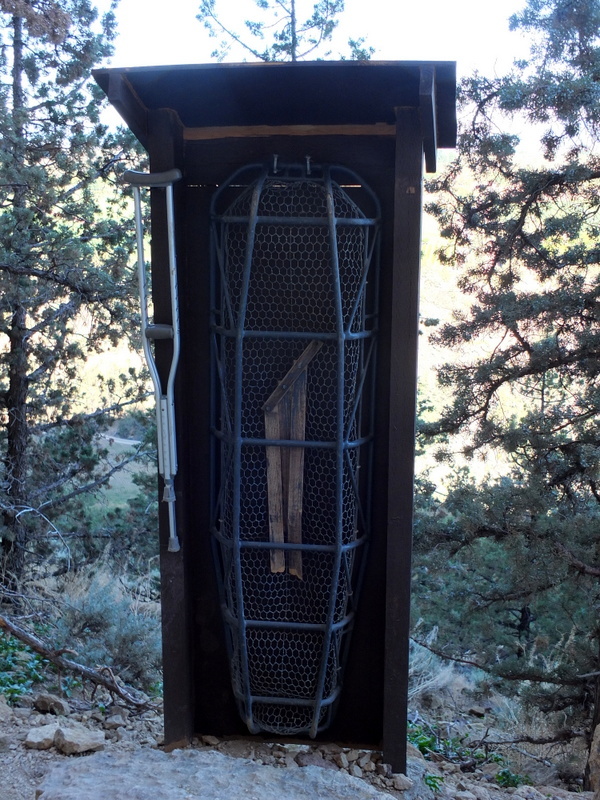 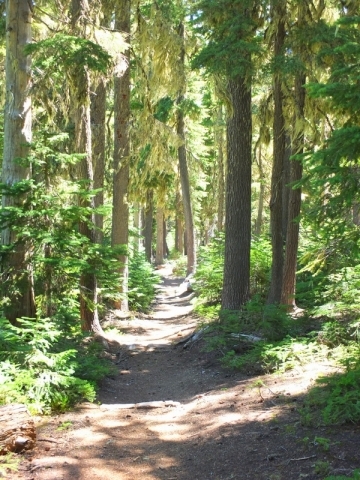 The trailhead is a short drive up into the mountains west of town past the Mt. 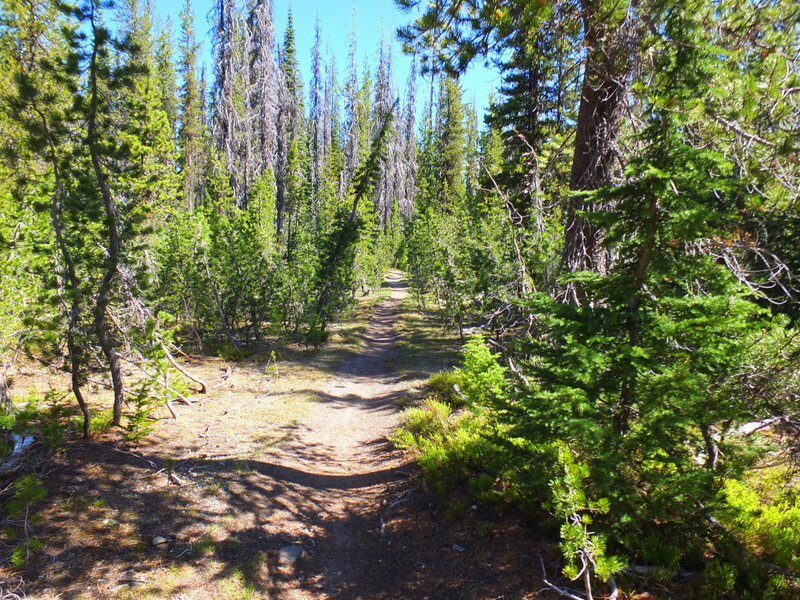 Bachelor Ski Area. 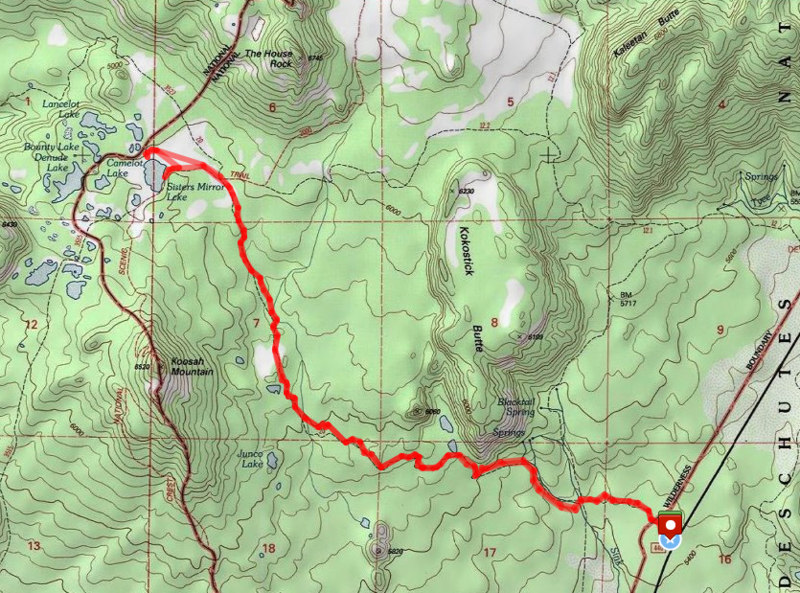 Their is a big driving loop up that way heading around to the south and a cut-off to Crater Lake — that was an added bonus following the hike. 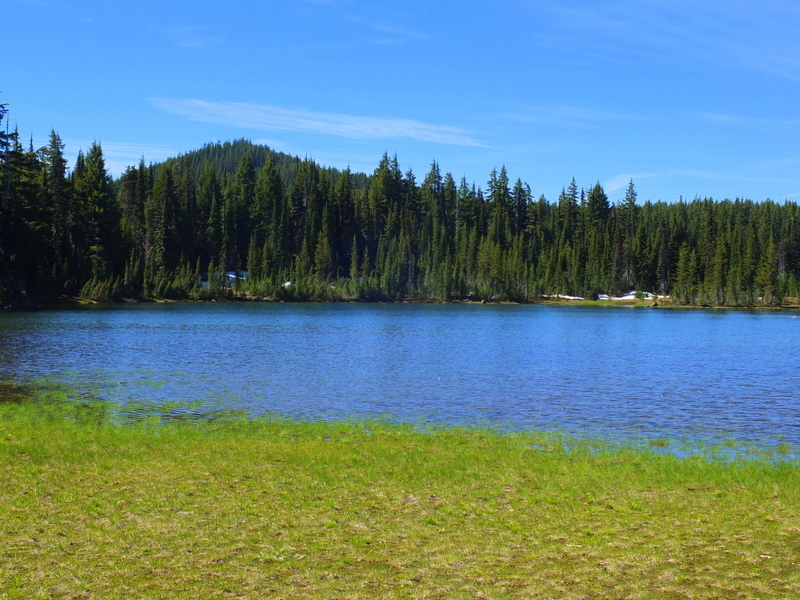 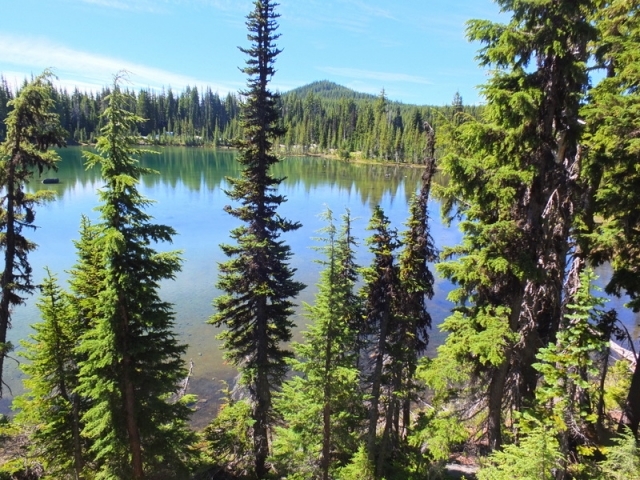 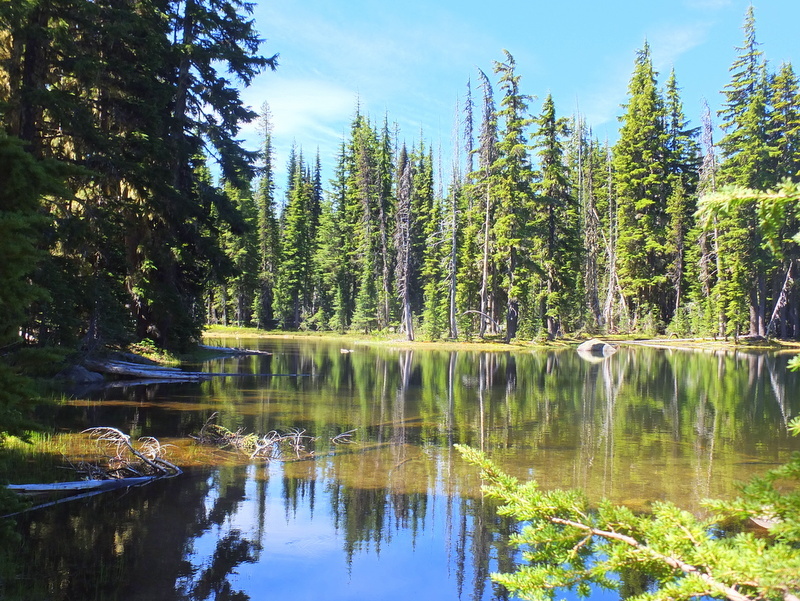 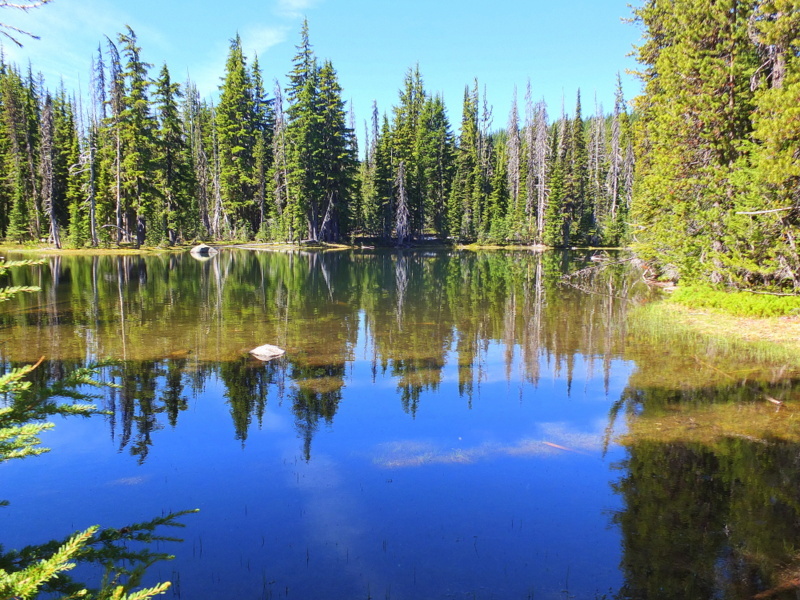 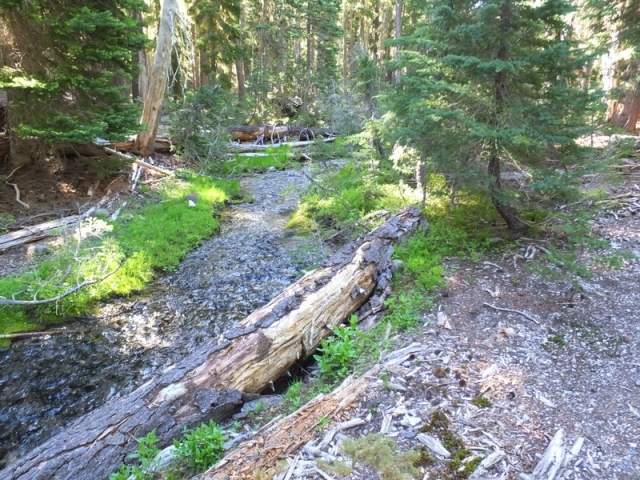 The route to Sisters Mirror Lake passes through conifer forest laced with small streams and dotted with ponds. 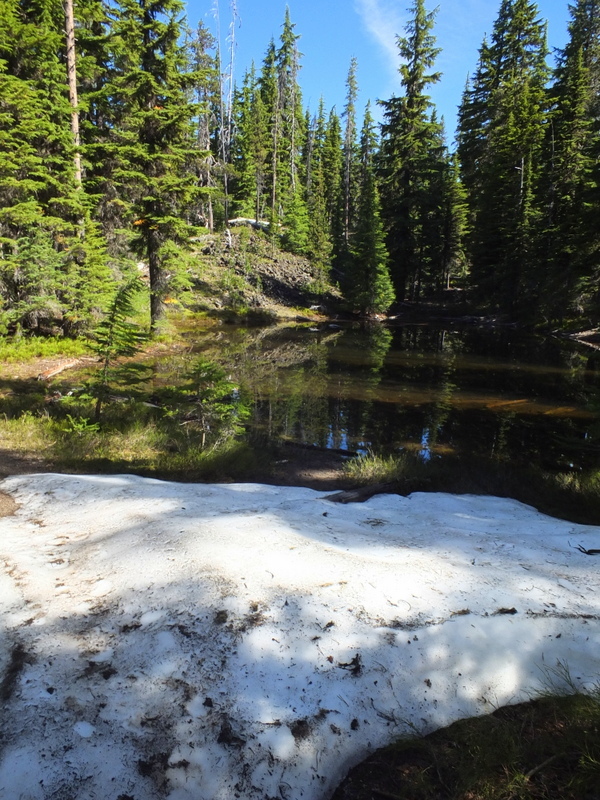 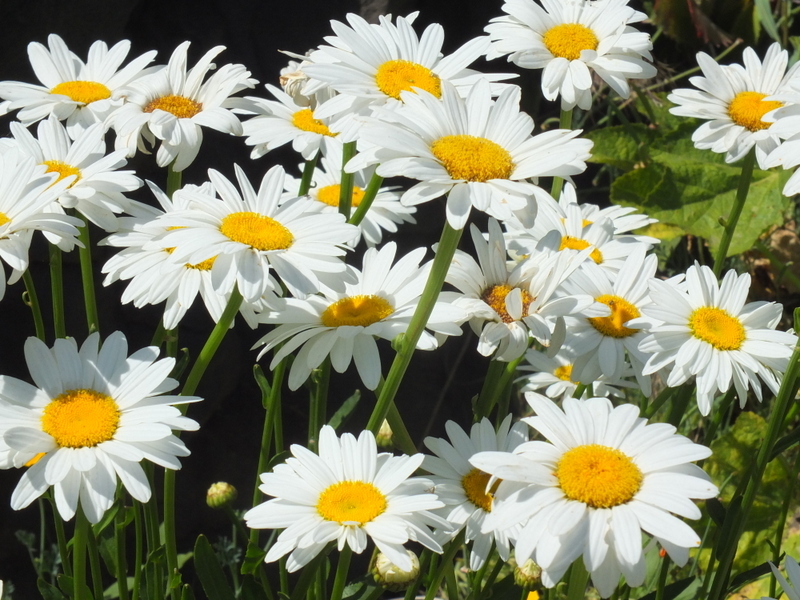 There was still snow scattered about in July. 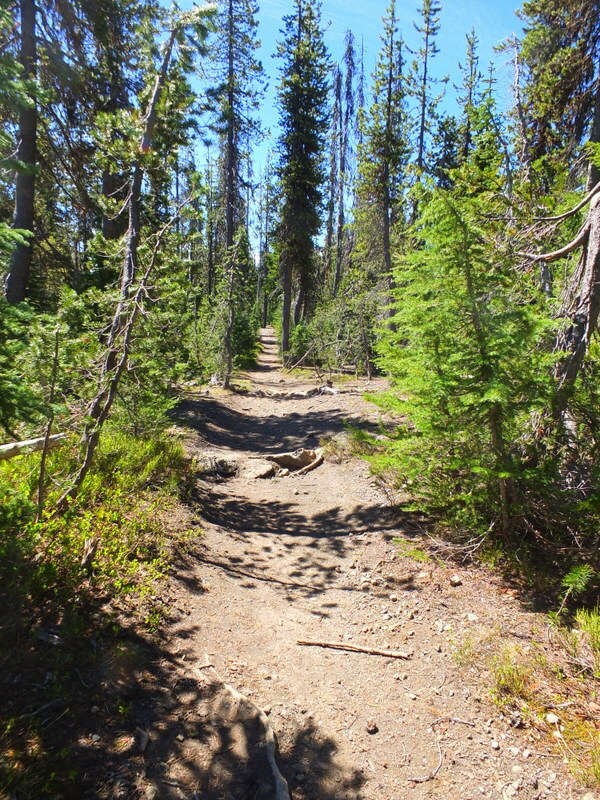 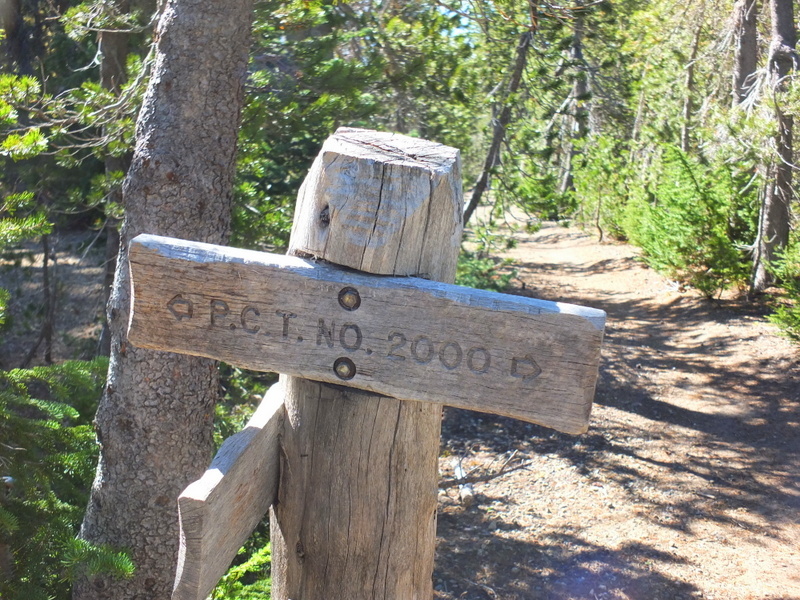 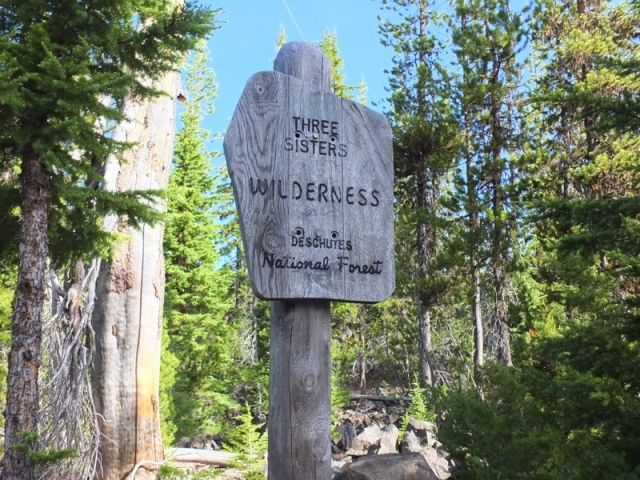 You eventually cross and follow the Pacific Coast Trail on this hike as it passes through the Three Sisters Wilderness area. 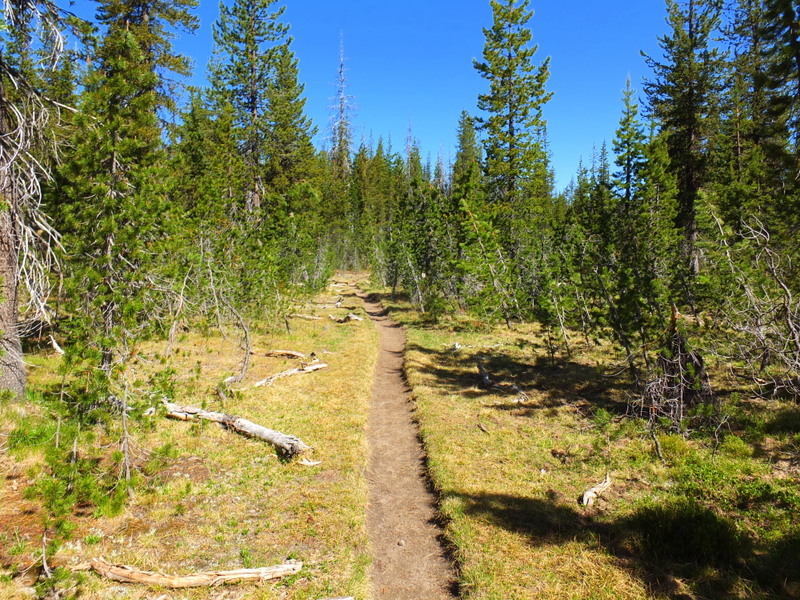 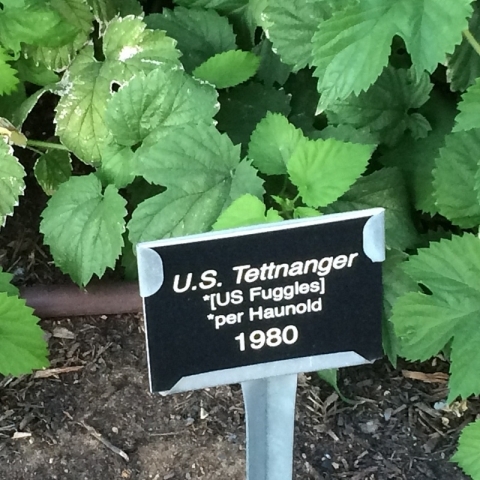 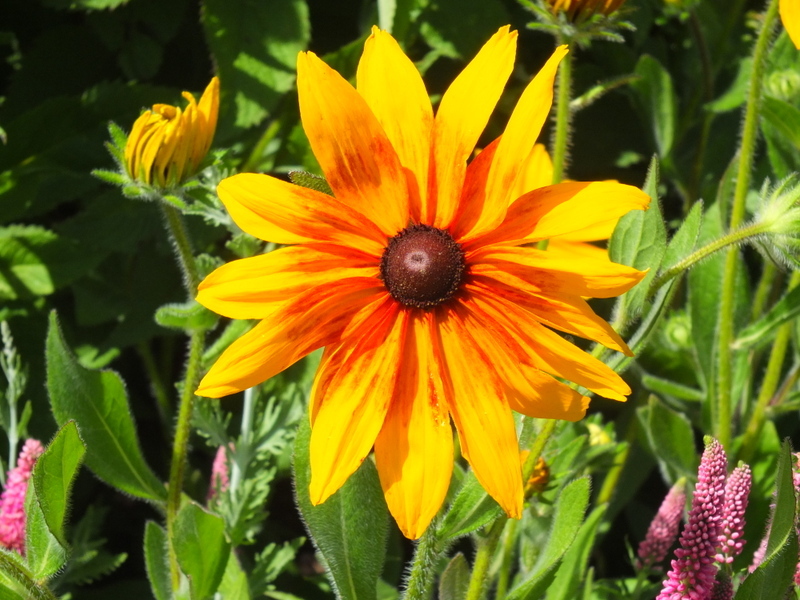 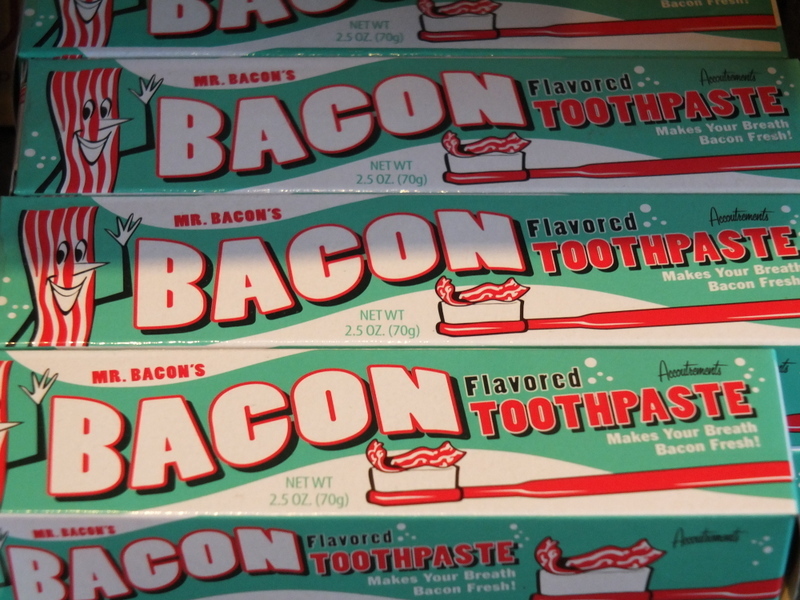 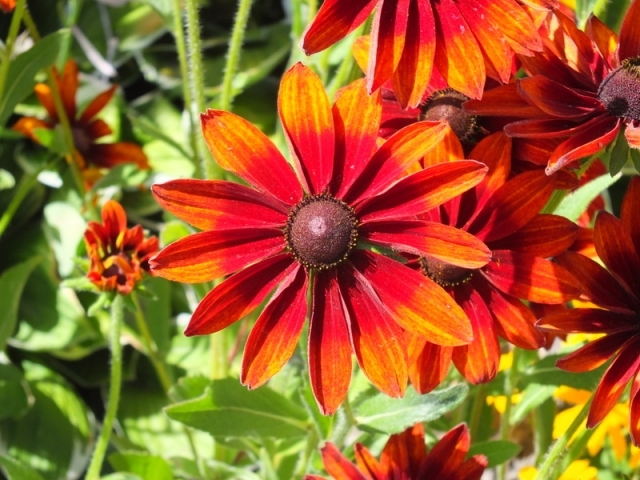 Be aware that there is voracious wildlife along the way and come prepared with protections. I encountered mosquitoes in swarms — one time as I brought my camera to my face I glanced at the back of my hand and it was covered with mosquitoes. 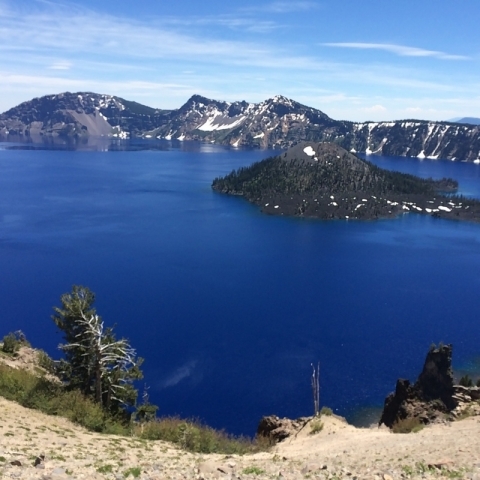 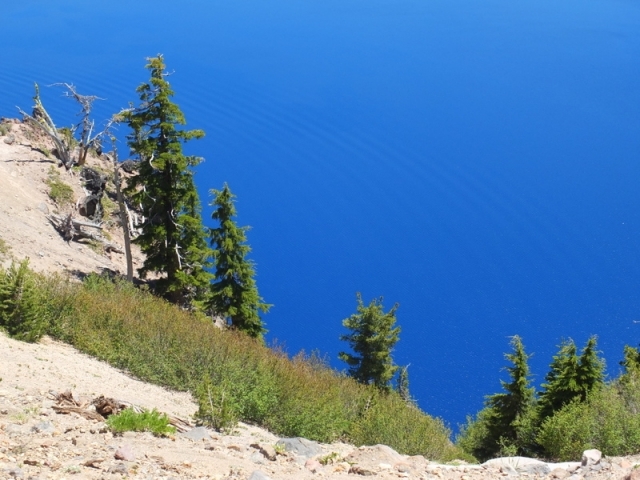 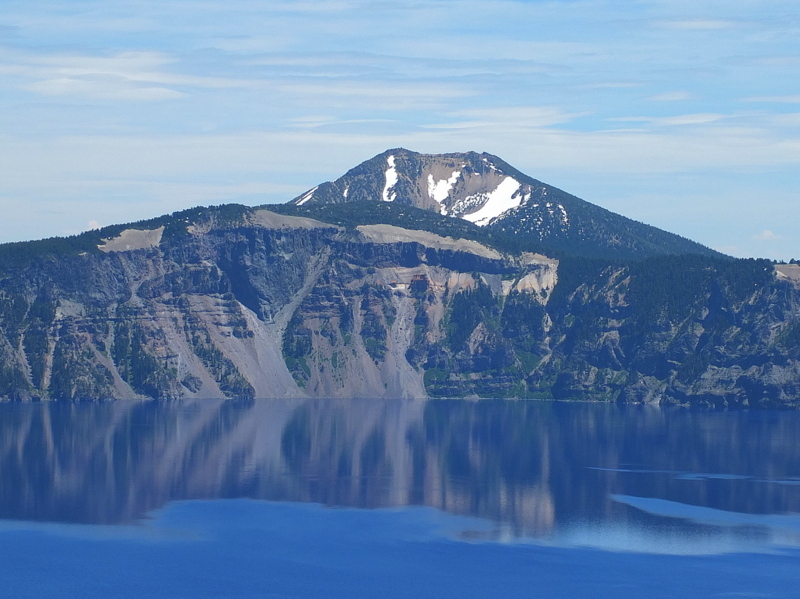 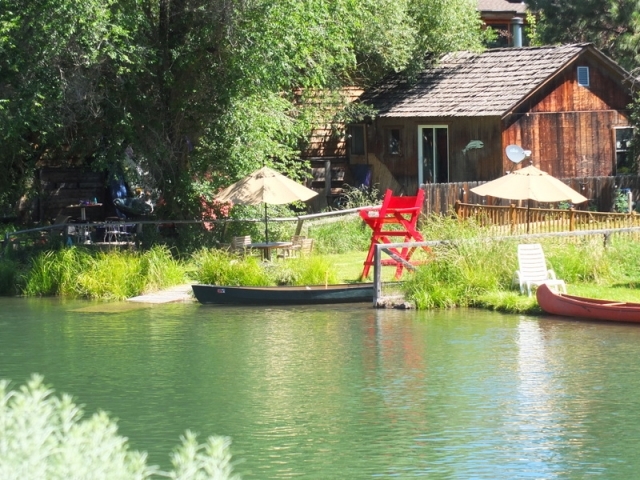 The hike rewards you with beautiful views of the lake and the surroundings.